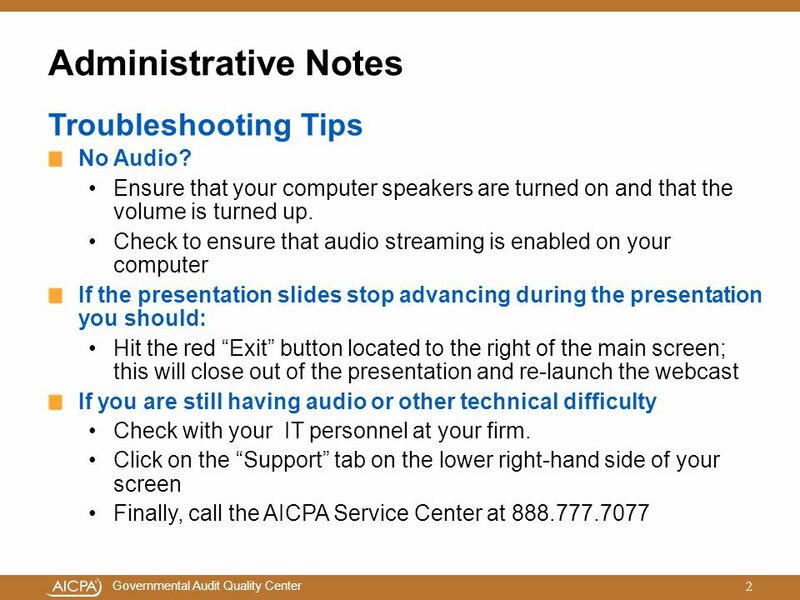 2 Administrative Notes Troubleshooting Tips No Audio? 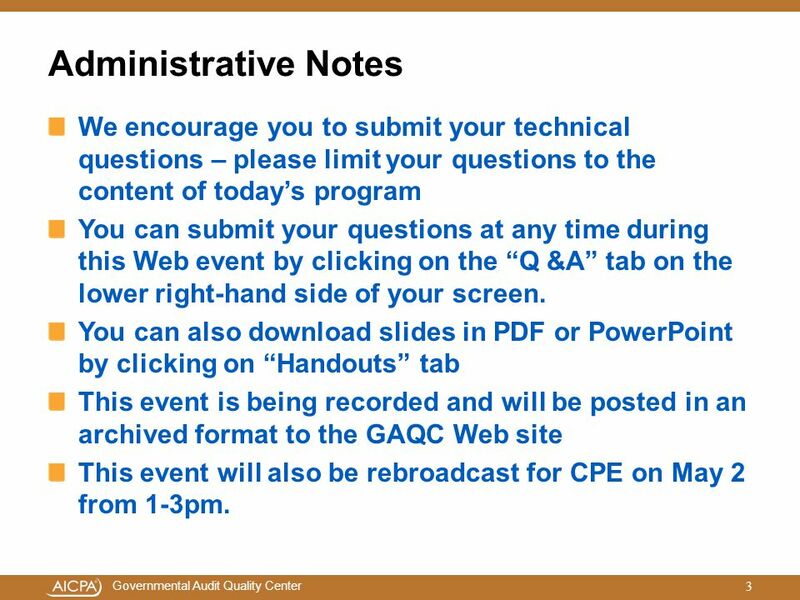 3 Administrative Notes We encourage you to submit your technical questions – please limit your questions to the content of today’s program You can submit your questions at any time during this Web event by clicking on the “Q &A” tab on the lower right-hand side of your screen. 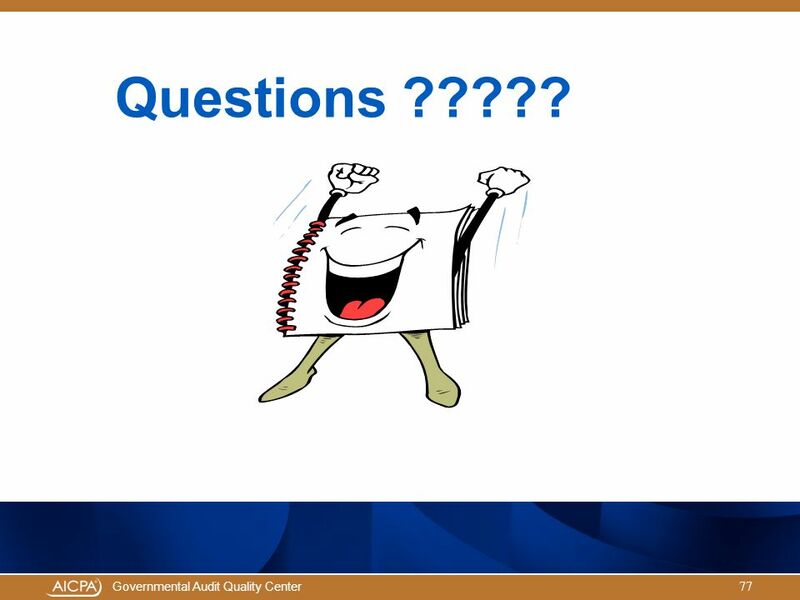 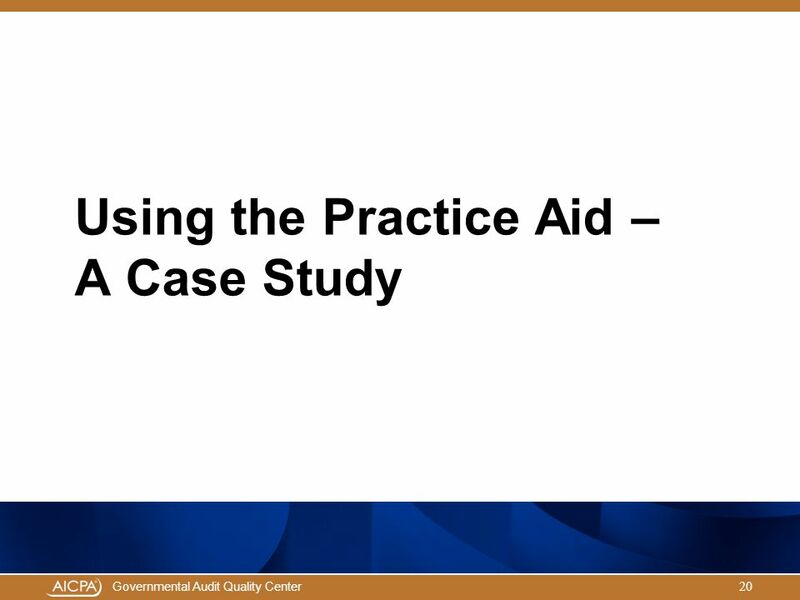 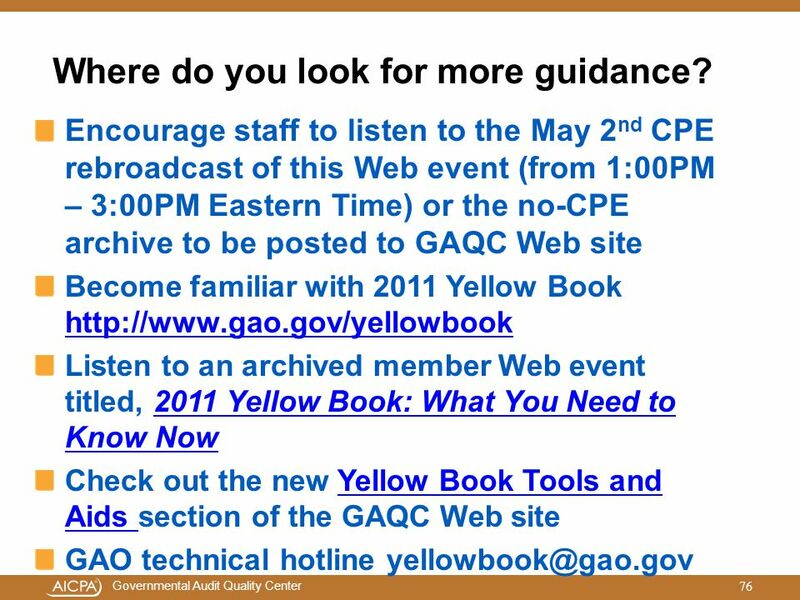 You can also download slides in PDF or PowerPoint by clicking on “Handouts” tab This event is being recorded and will be posted in an archived format to the GAQC Web site This event will also be rebroadcast for CPE on May 2 from 1-3pm. 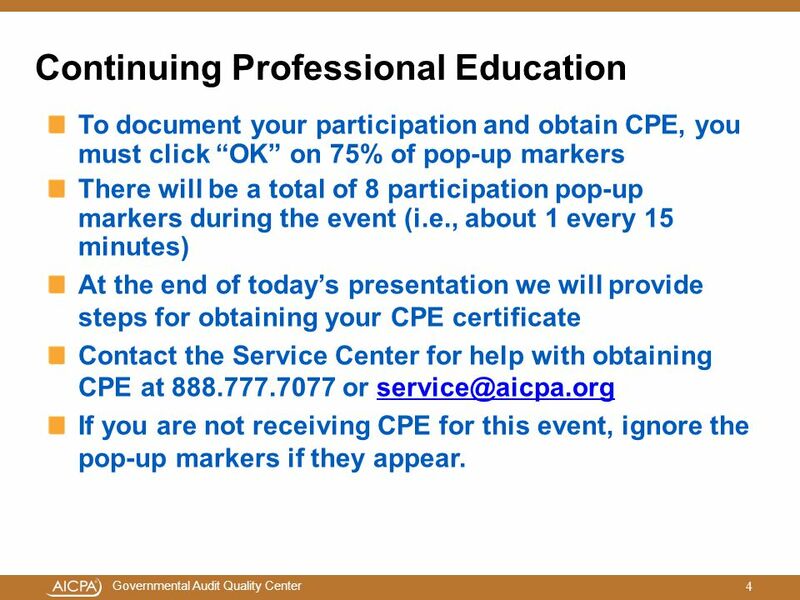 To document your participation and obtain CPE, you must click “OK” on 75% of pop-up markers There will be a total of 8 participation pop-up markers during the event (i.e., about 1 every 15 minutes) At the end of today’s presentation we will provide steps for obtaining your CPE certificate Contact the Service Center for help with obtaining CPE at or If you are not receiving CPE for this event, ignore the pop-up markers if they appear. 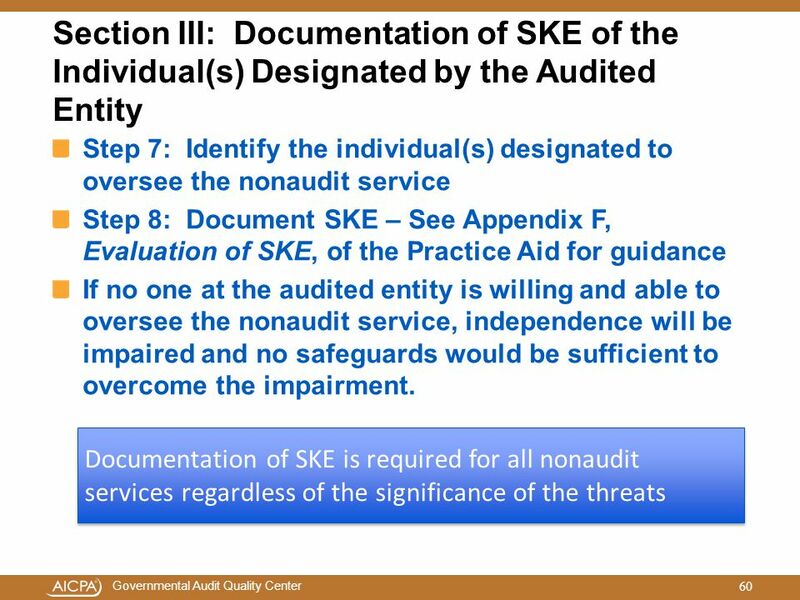 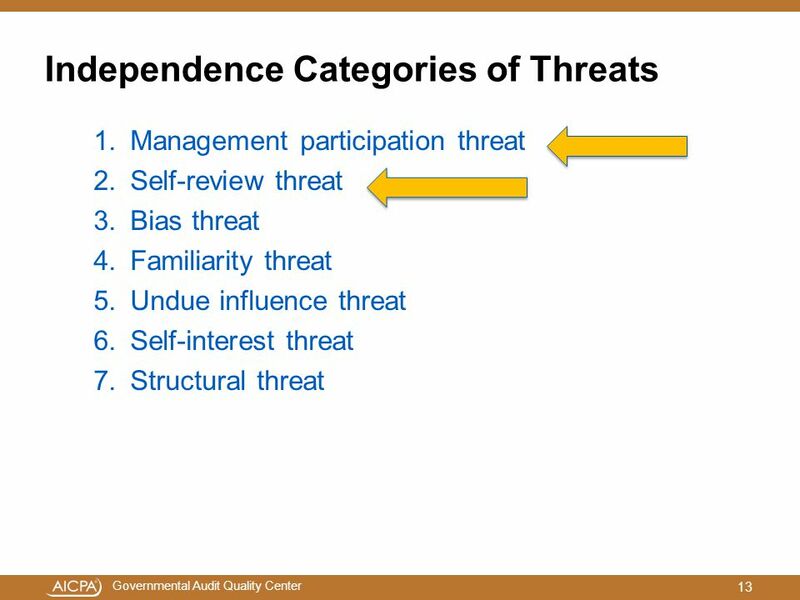 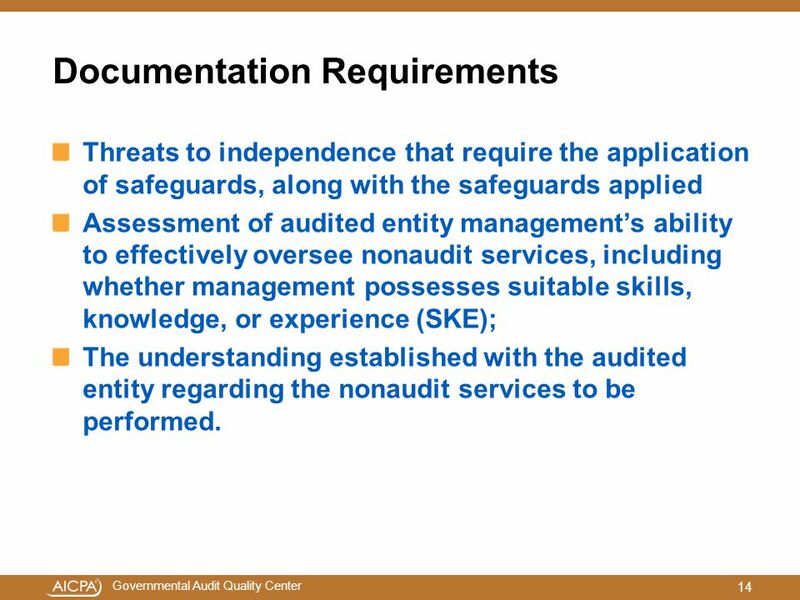 Threats to independence that require the application of safeguards, along with the safeguards applied Assessment of audited entity management’s ability to effectively oversee nonaudit services, including whether management possesses suitable skills, knowledge, or experience (SKE); The understanding established with the audited entity regarding the nonaudit services to be performed. 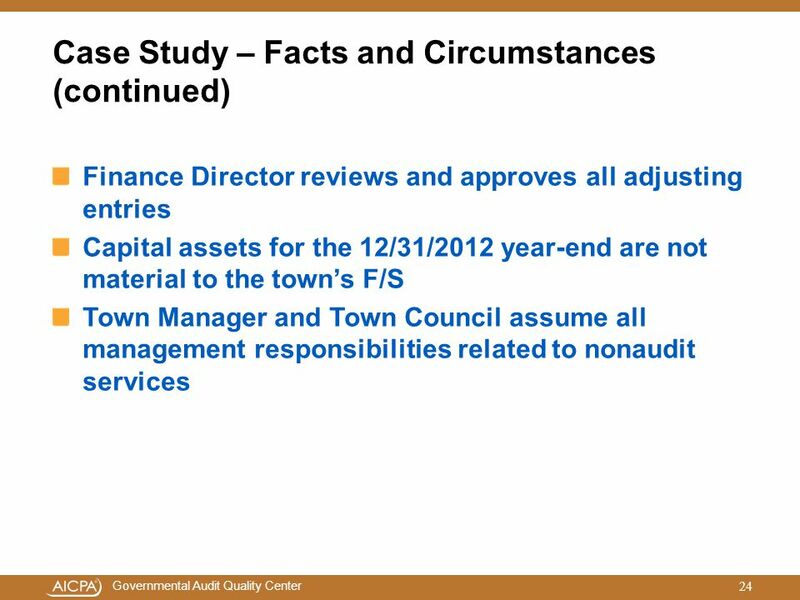 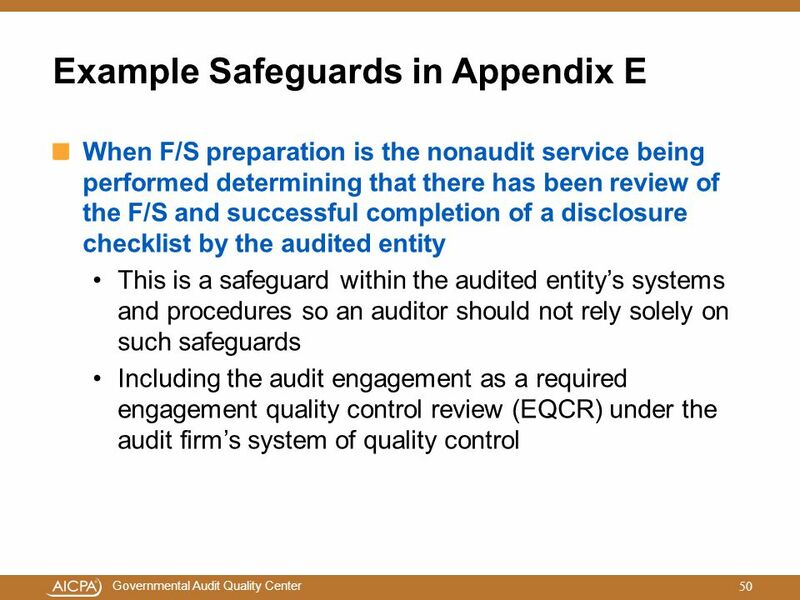 Auditor has been requested to prepare the F/S for an audited entity. 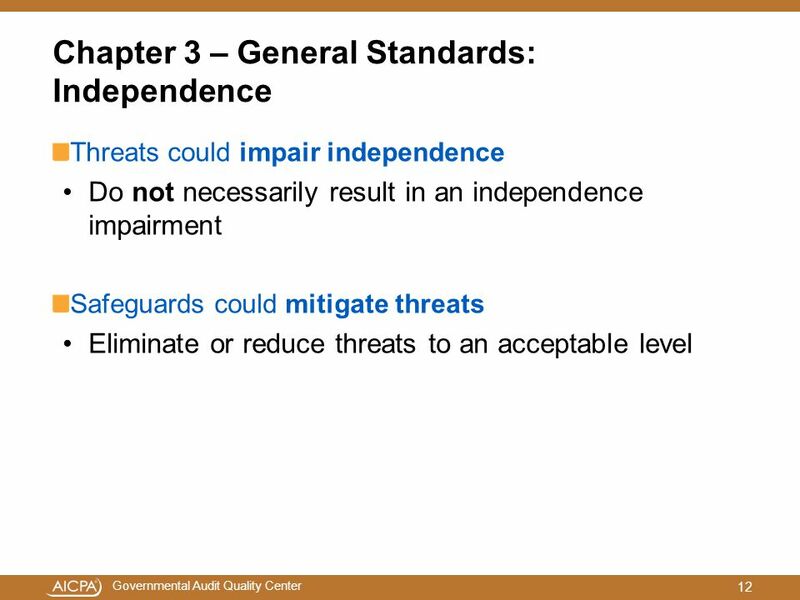 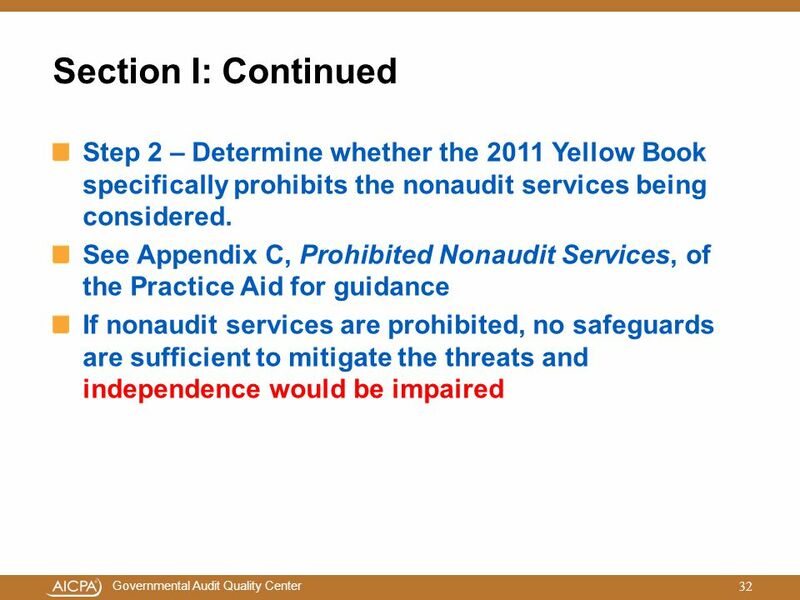 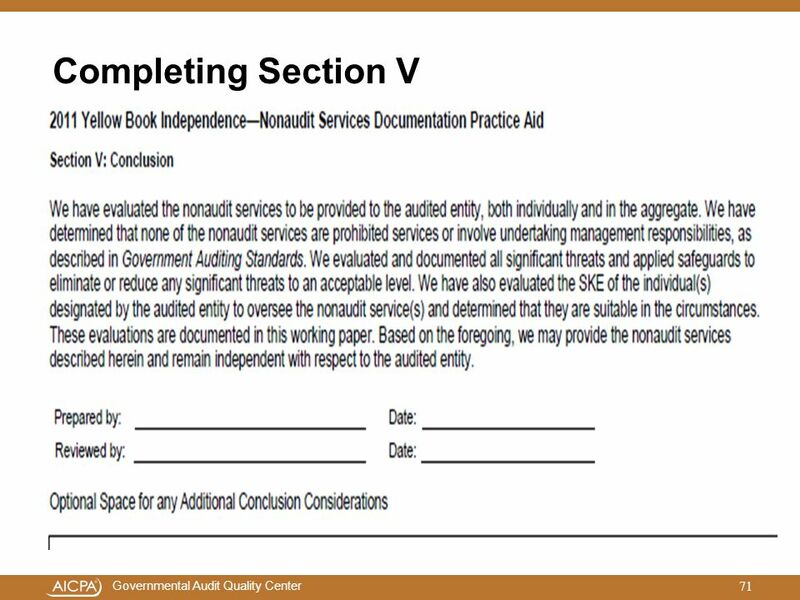 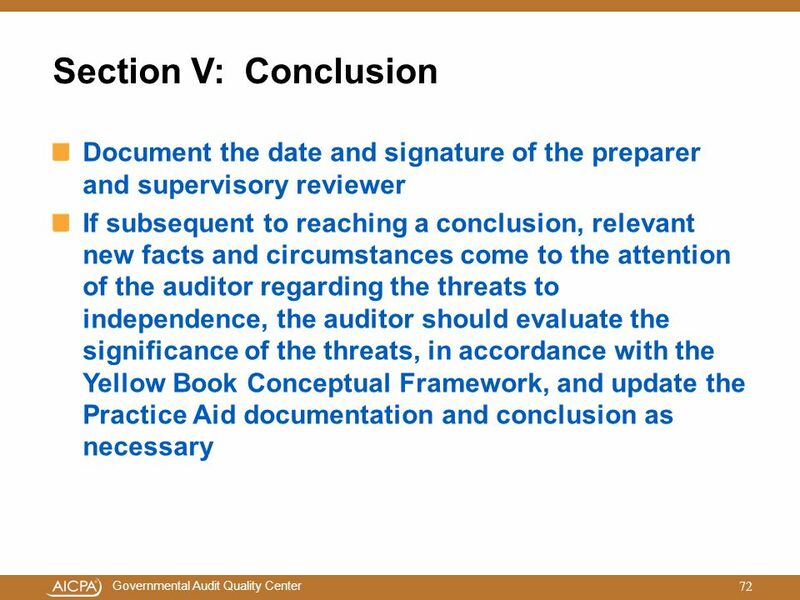 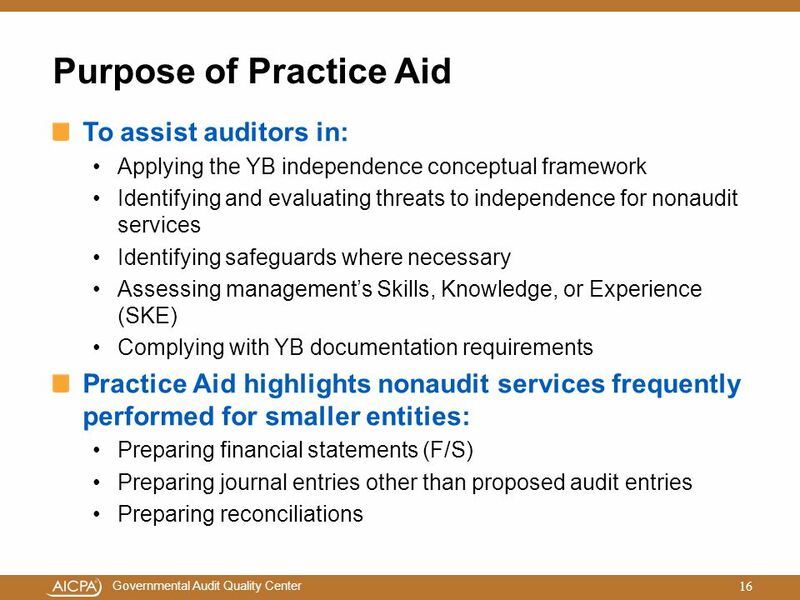 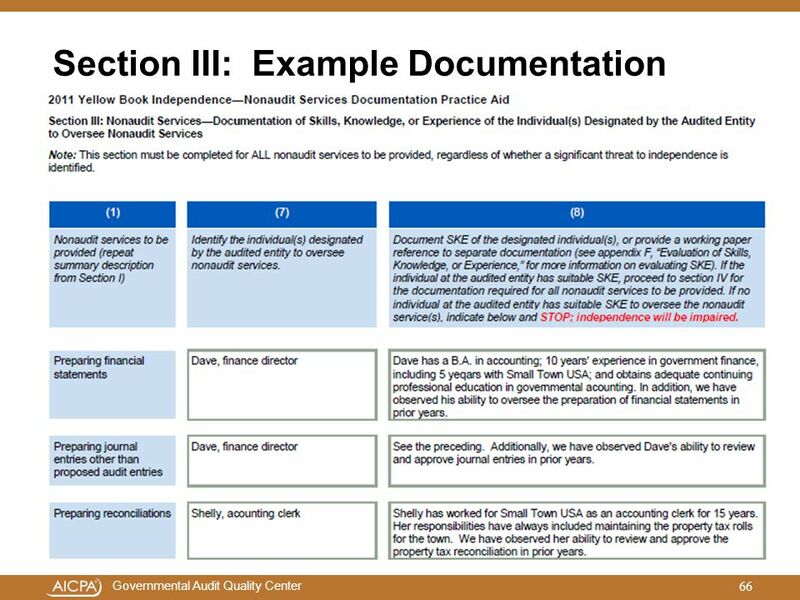 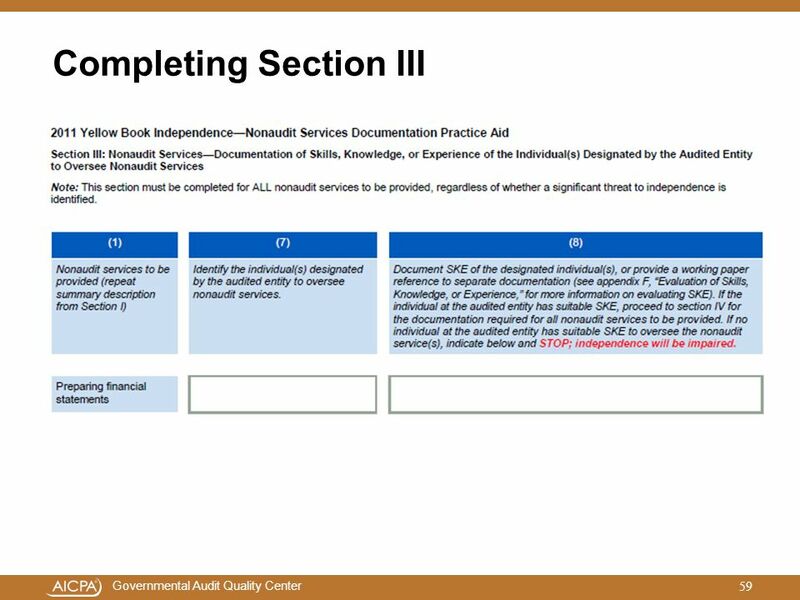 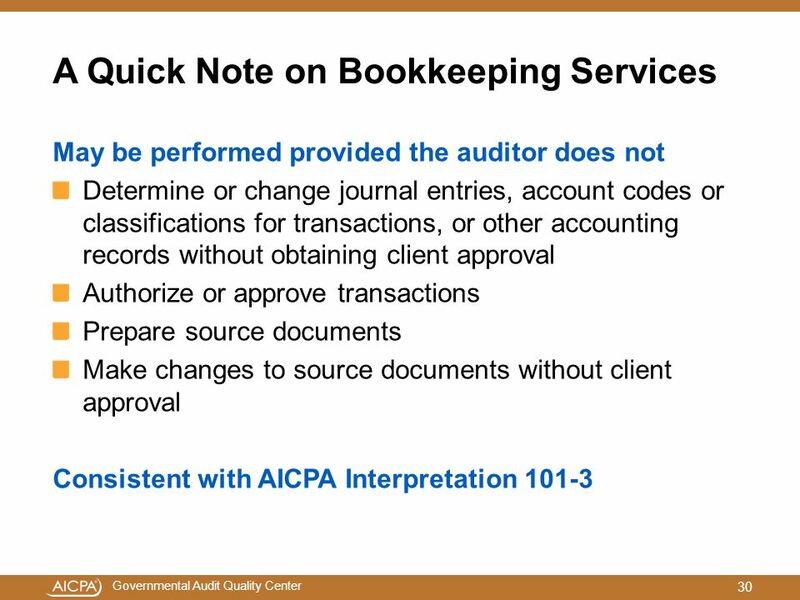 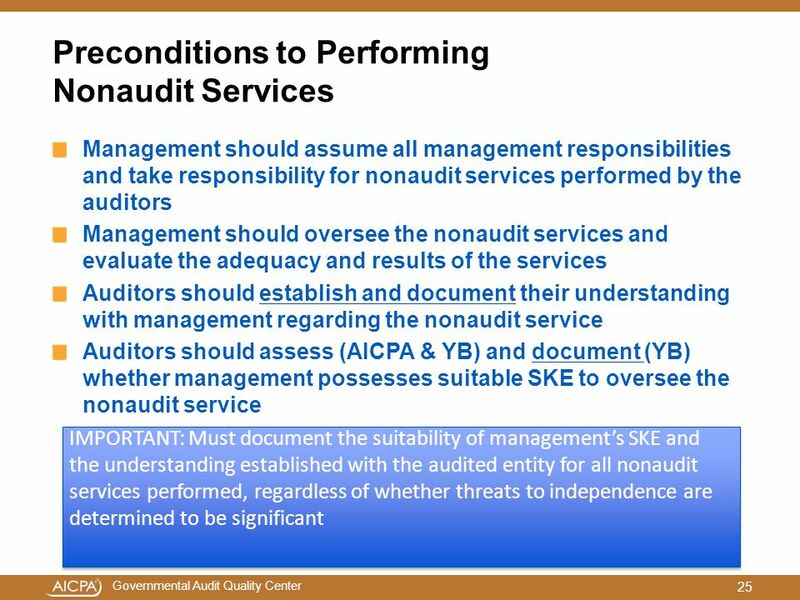 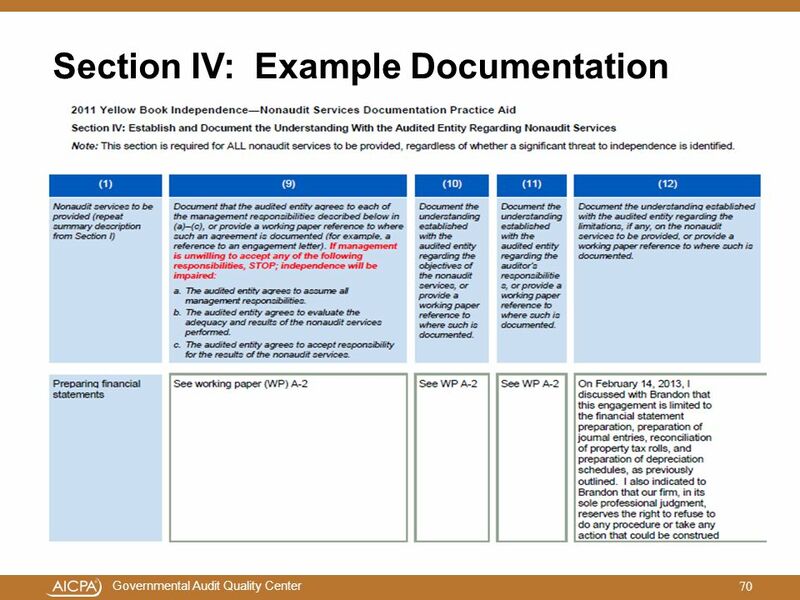 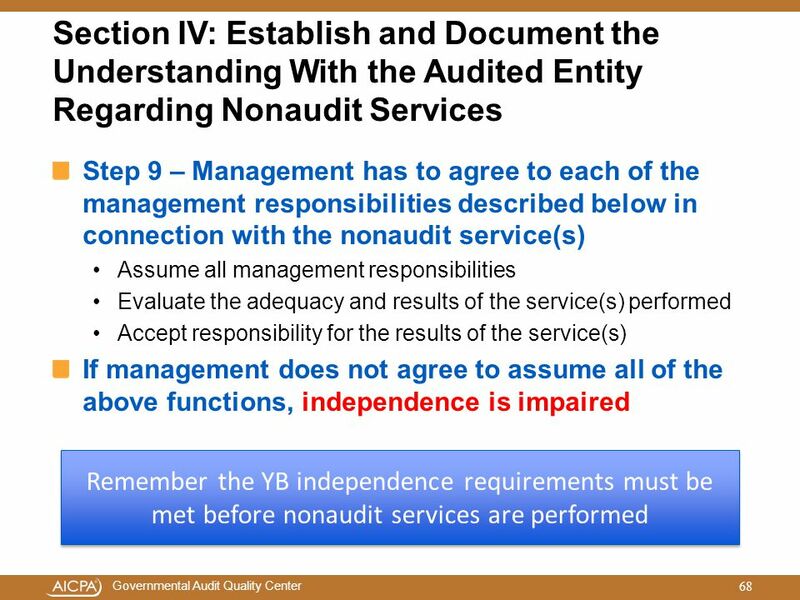 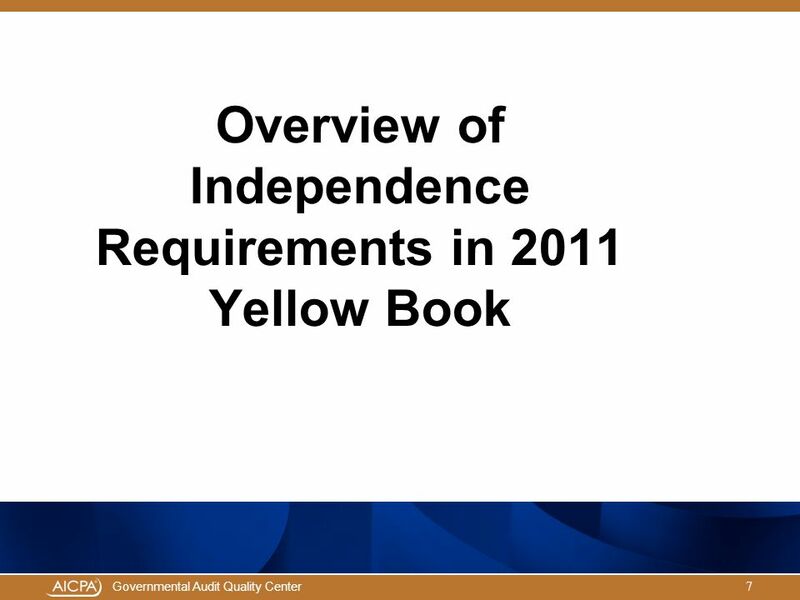 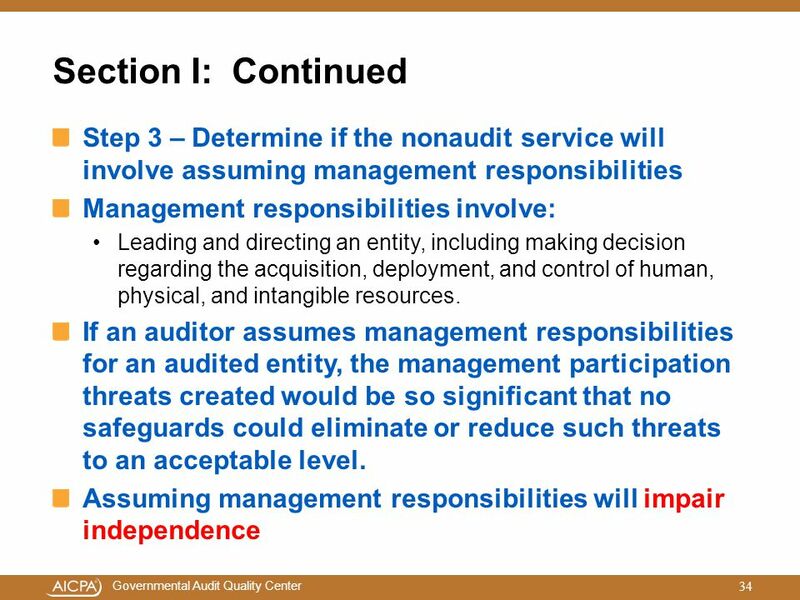 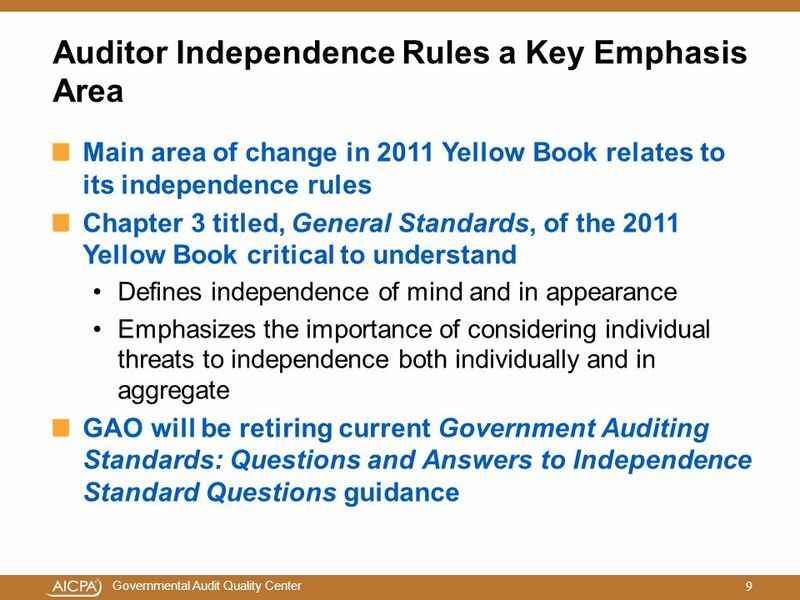 The auditor considered the following in evaluating whether a significant threat to independence existed: The audited entity’s books and records are substantially complete and accurate. 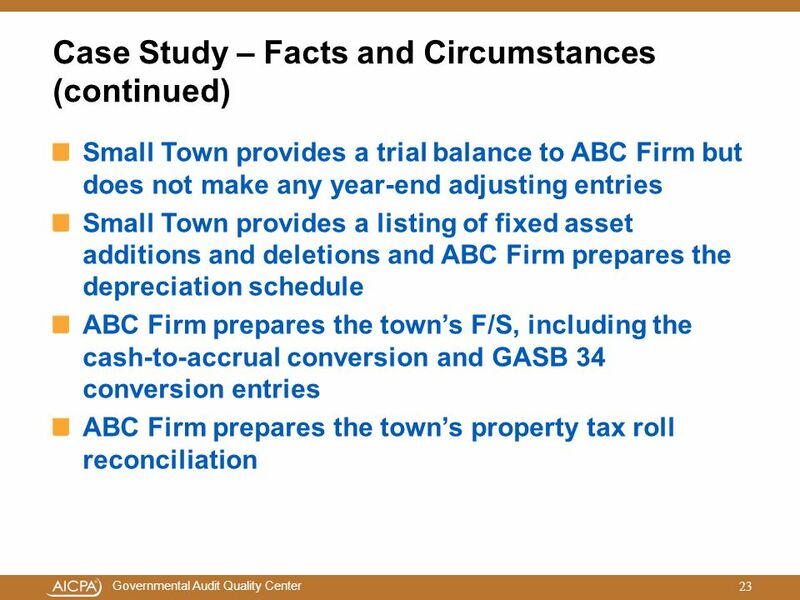 Few, if any correcting entries are expected to be proposed. 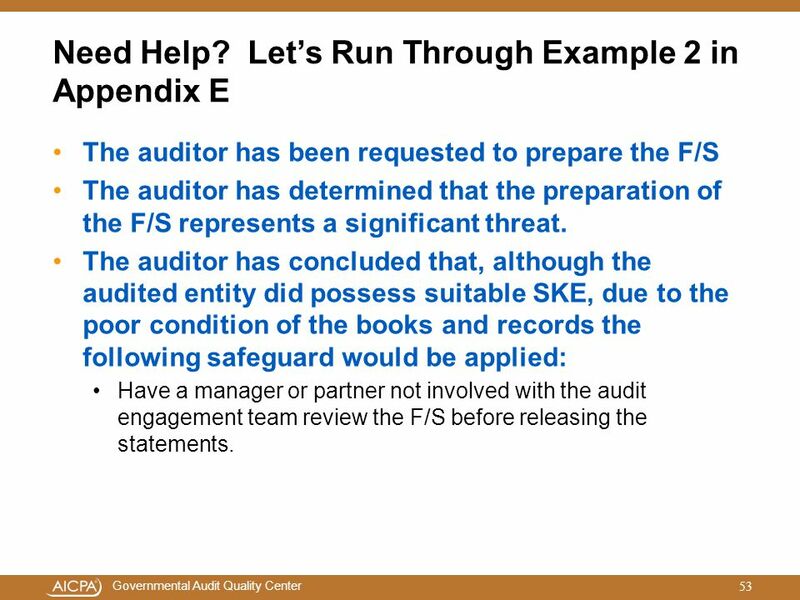 The individual designated by the audited entity who oversees the preparation of the F/S possesses SKE sufficient to oversee the service but is not capable of reperformance. 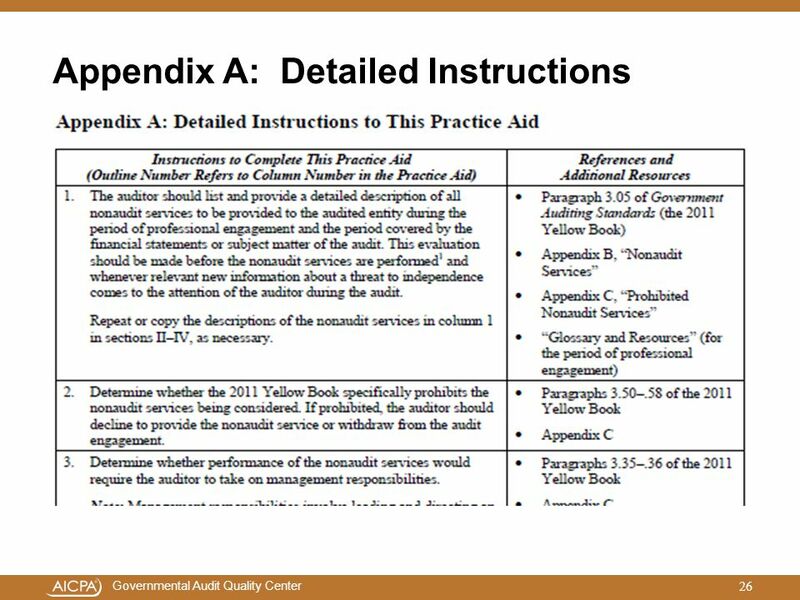 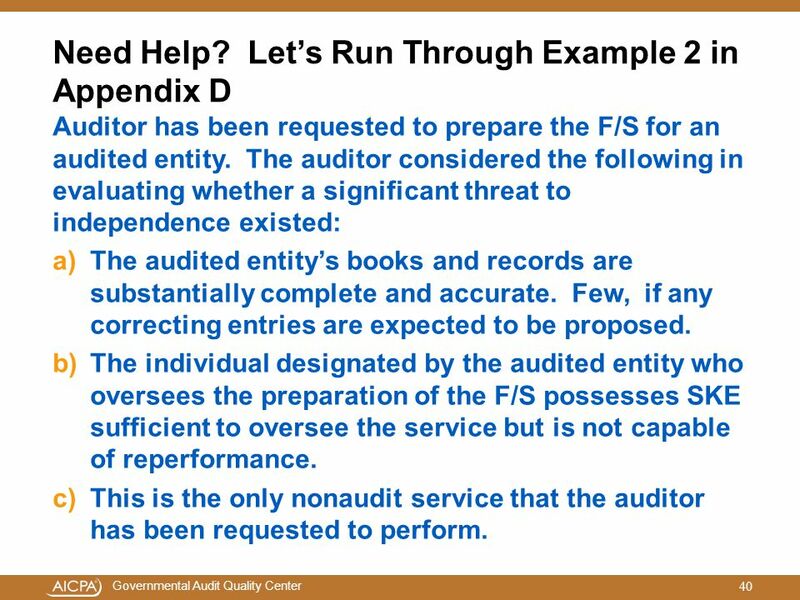 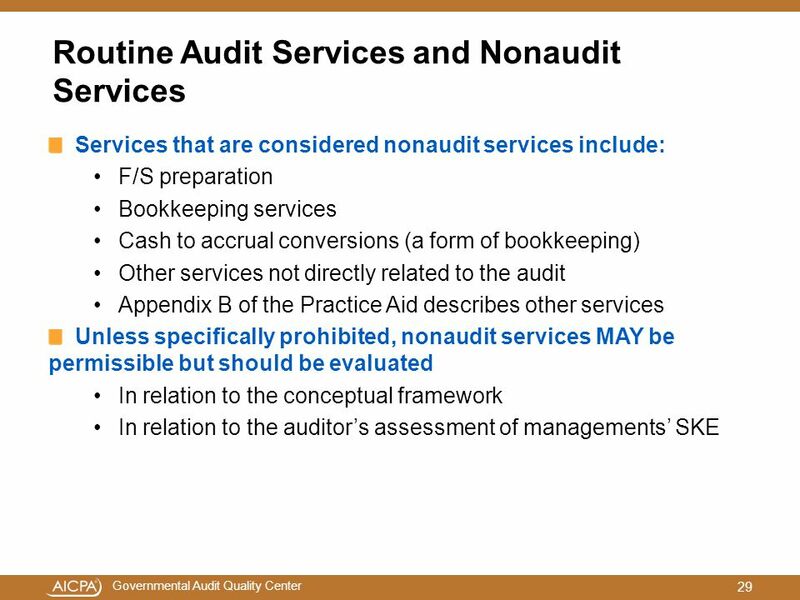 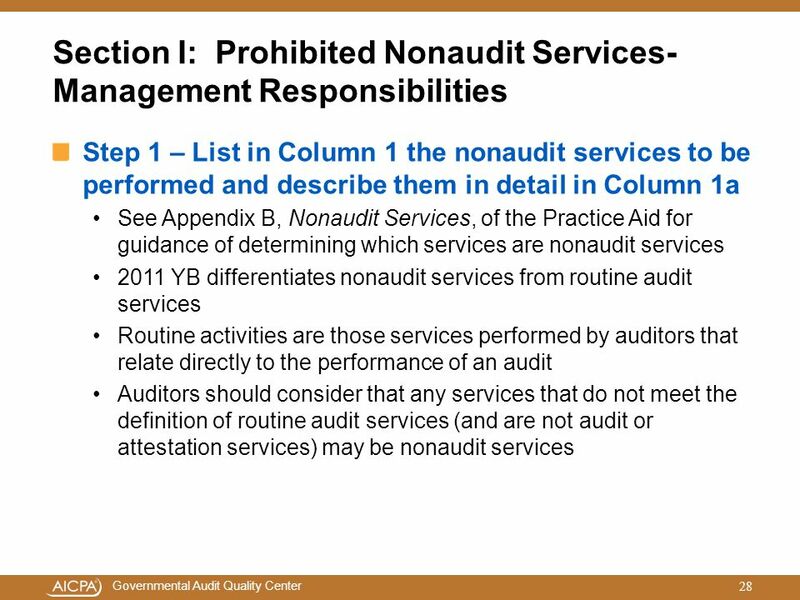 This is the only nonaudit service that the auditor has been requested to perform. 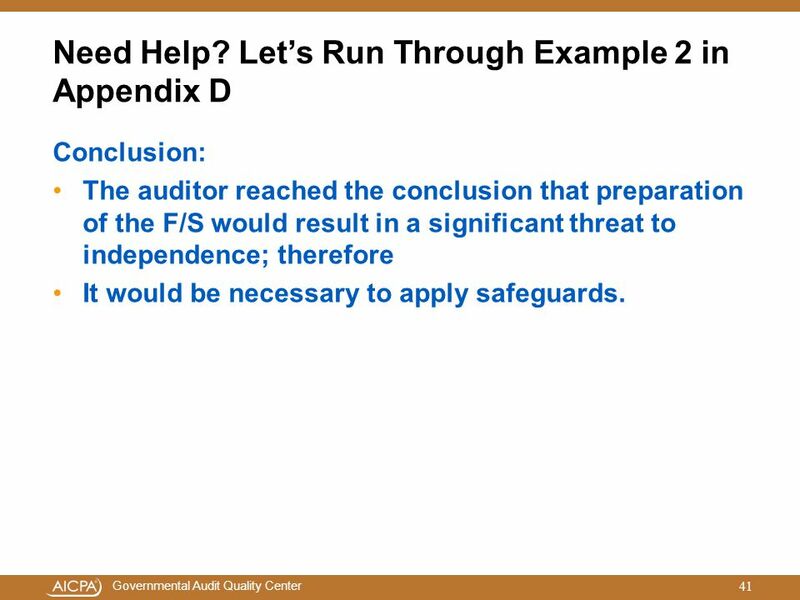 Conclusion: The auditor reached the conclusion that preparation of the F/S would result in a significant threat to independence; therefore It would be necessary to apply safeguards. 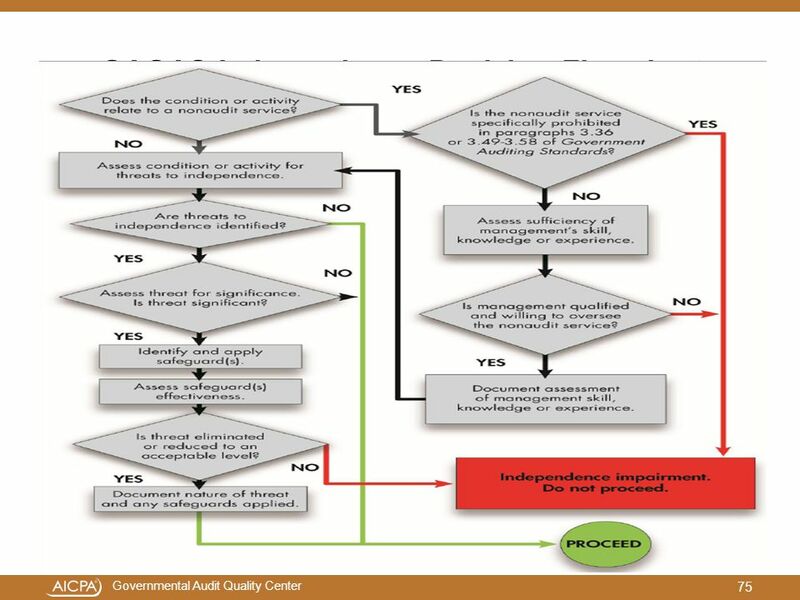 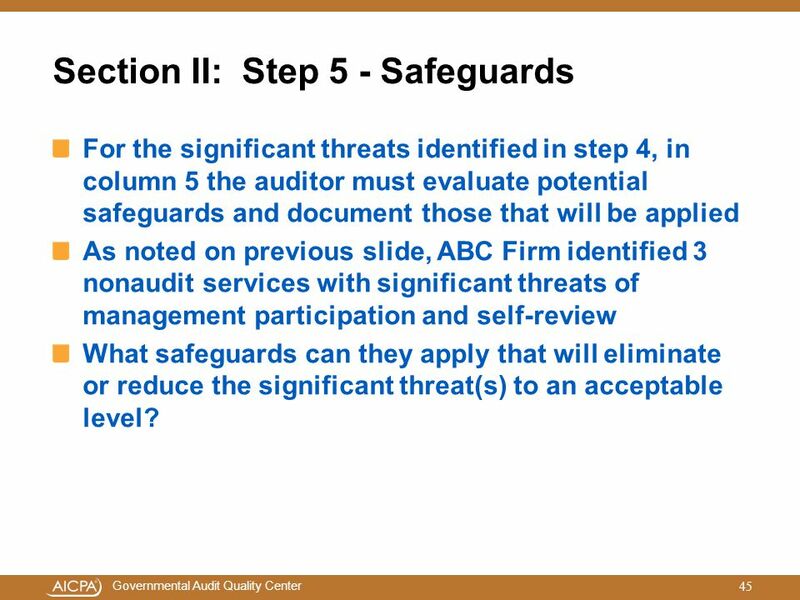 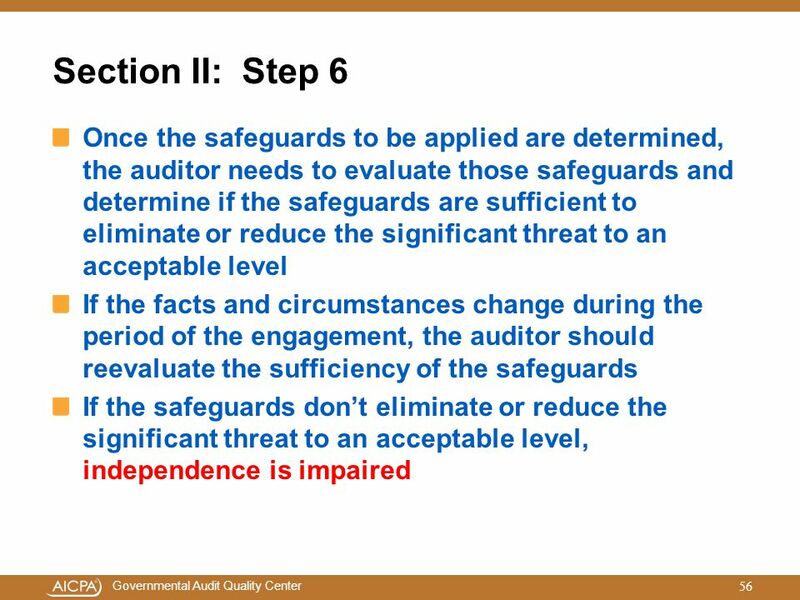 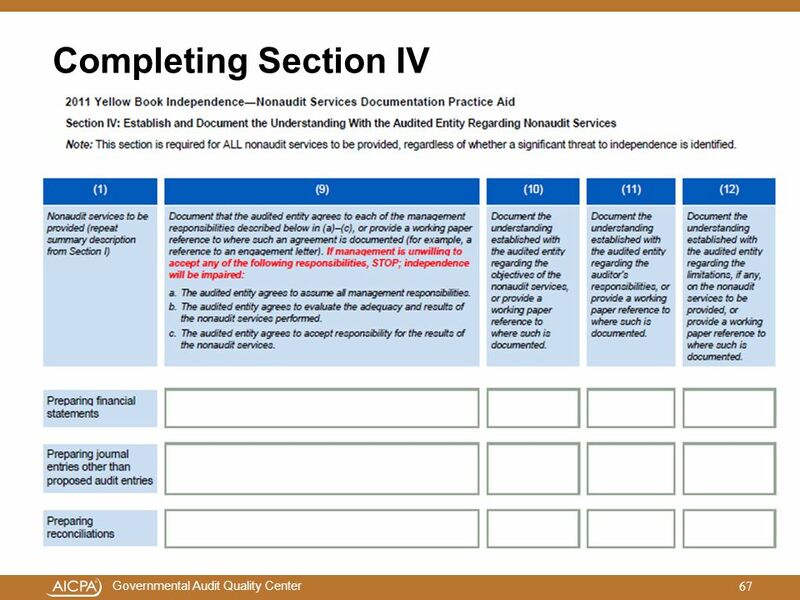 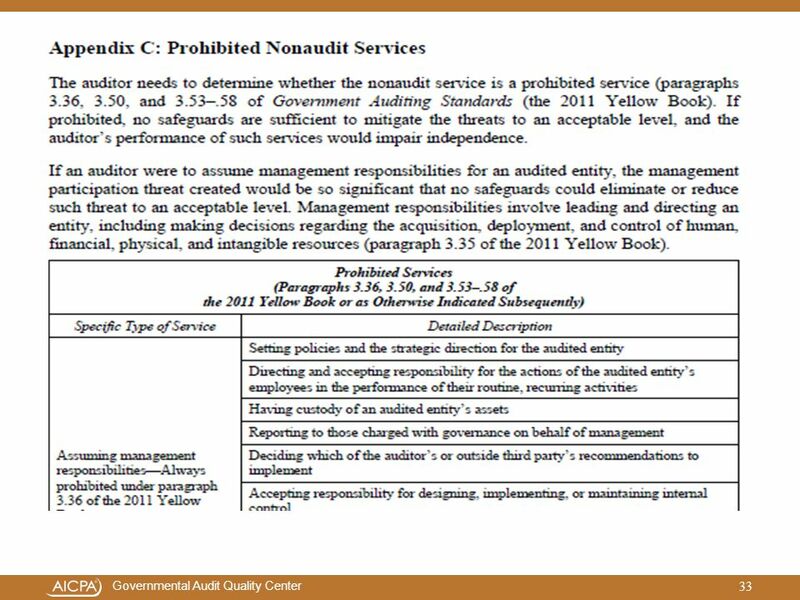 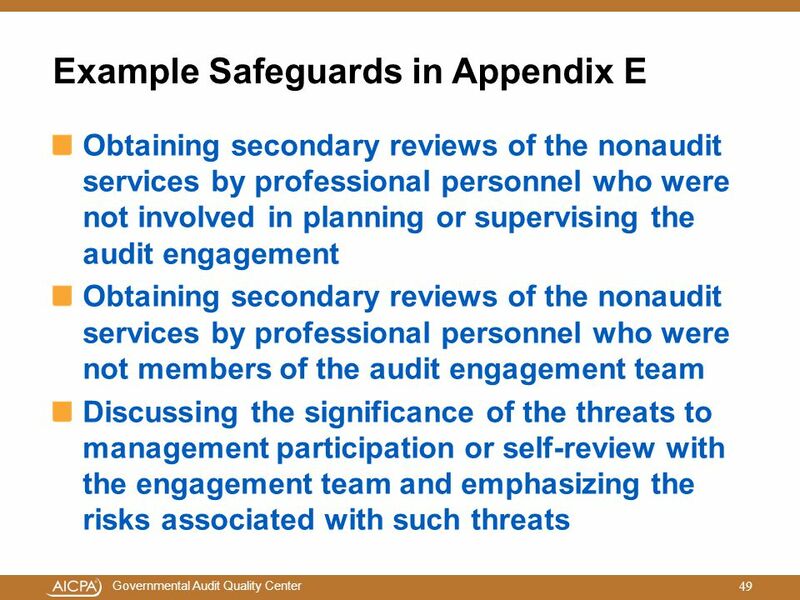 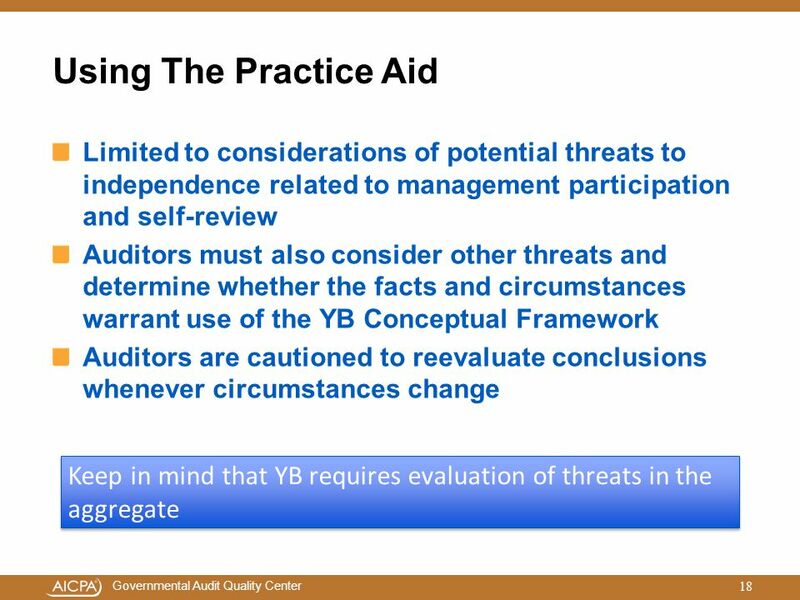 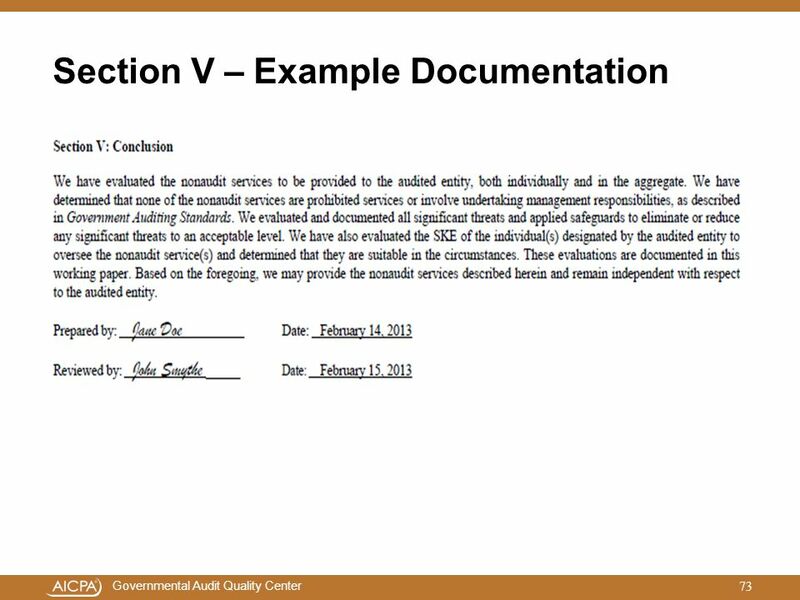 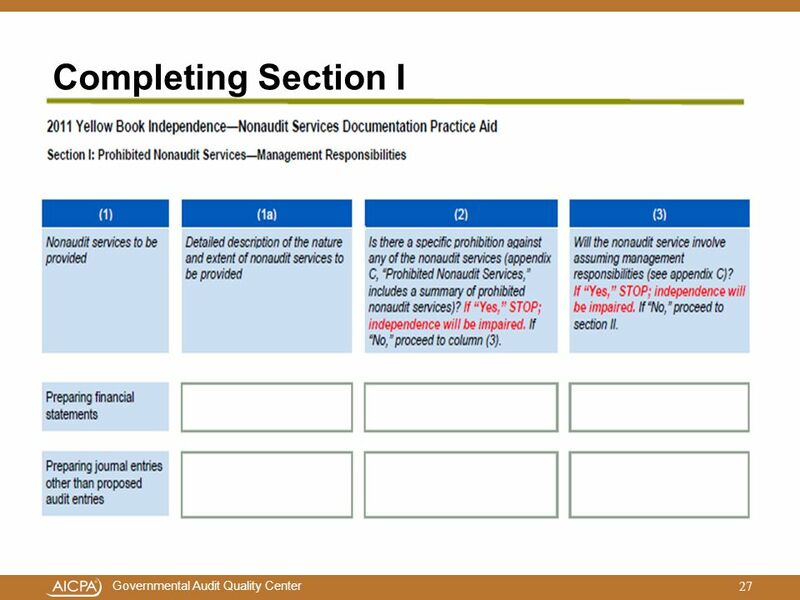 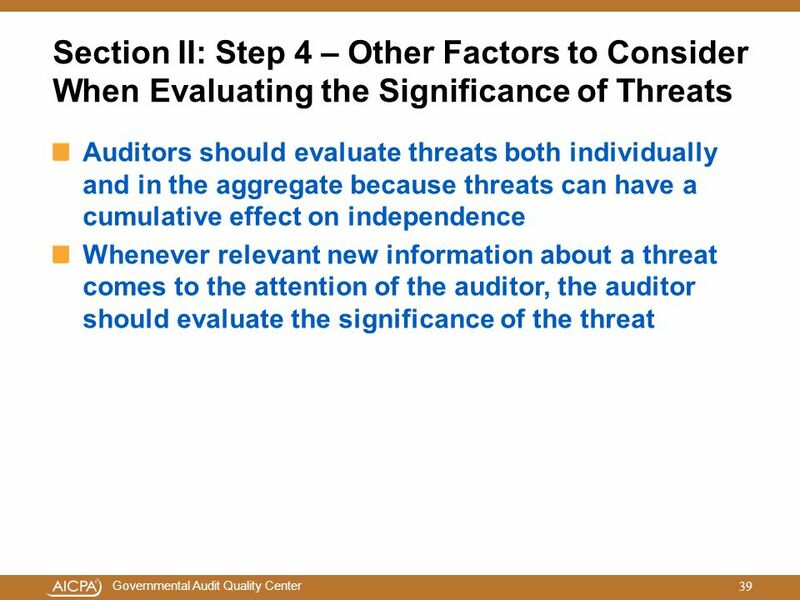 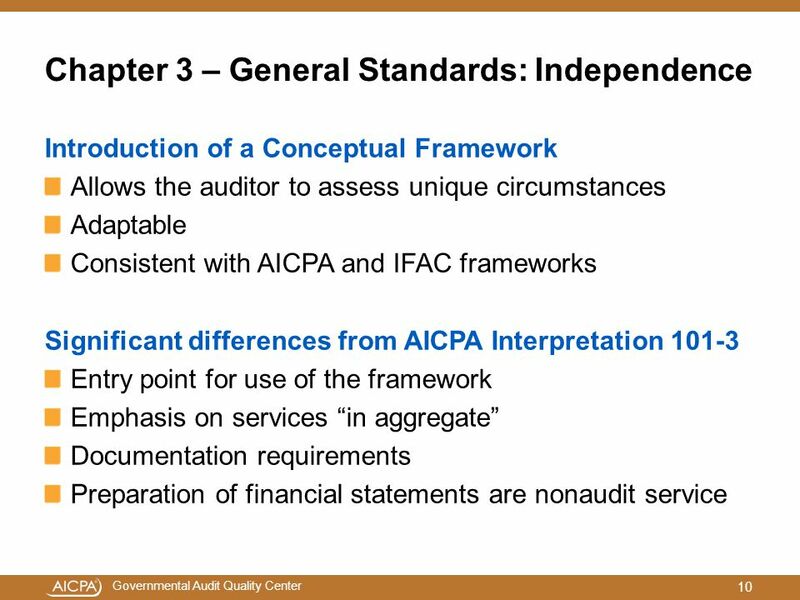 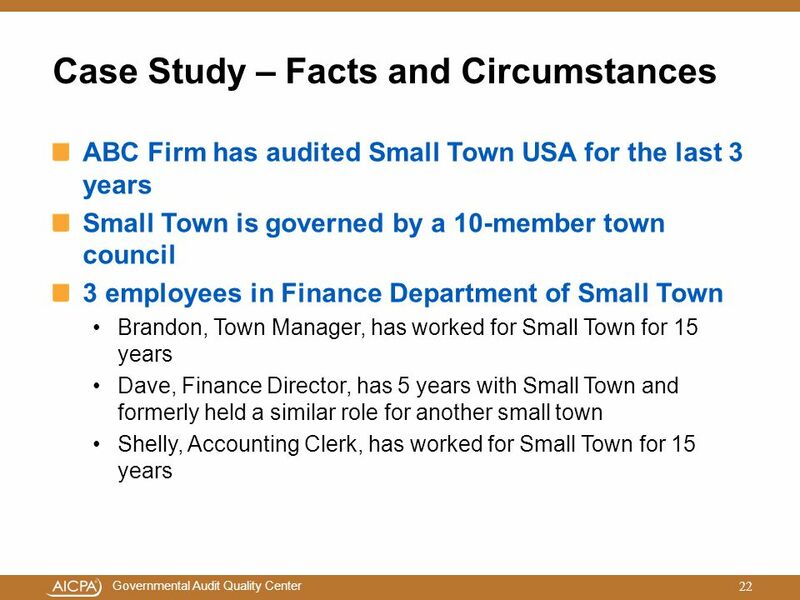 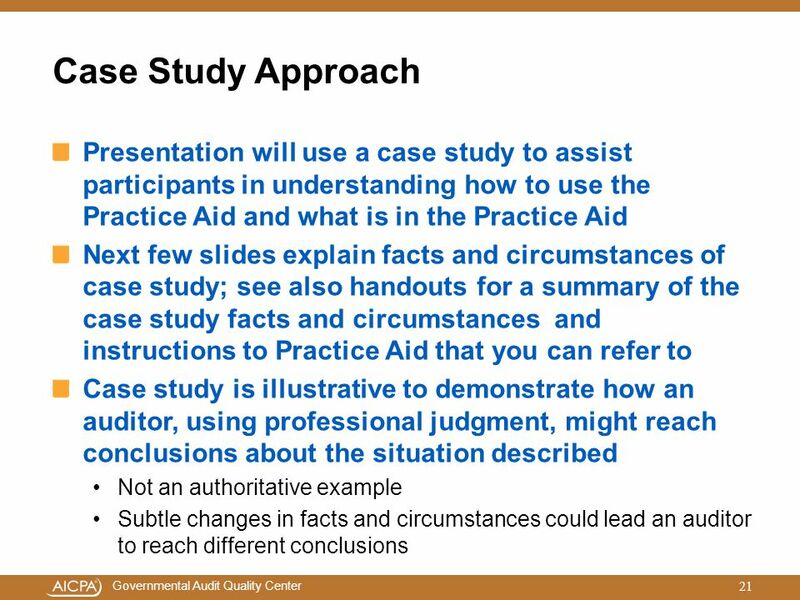 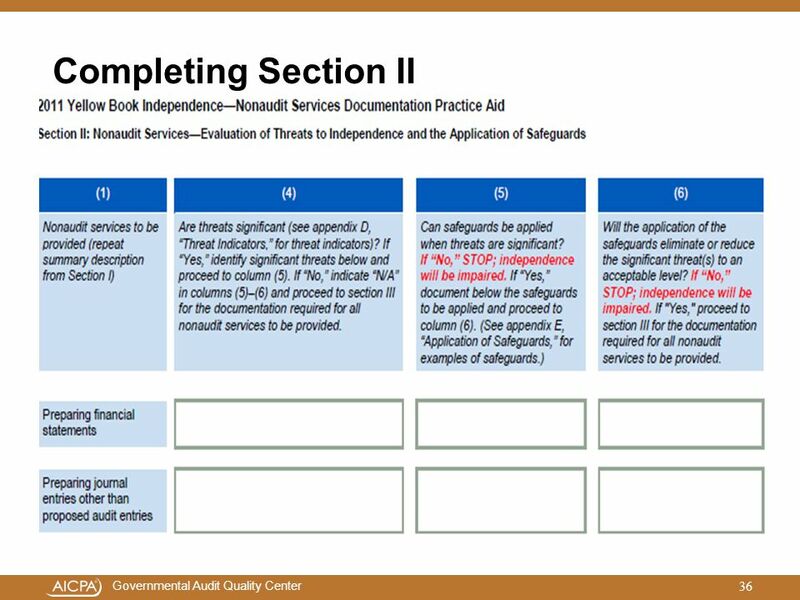 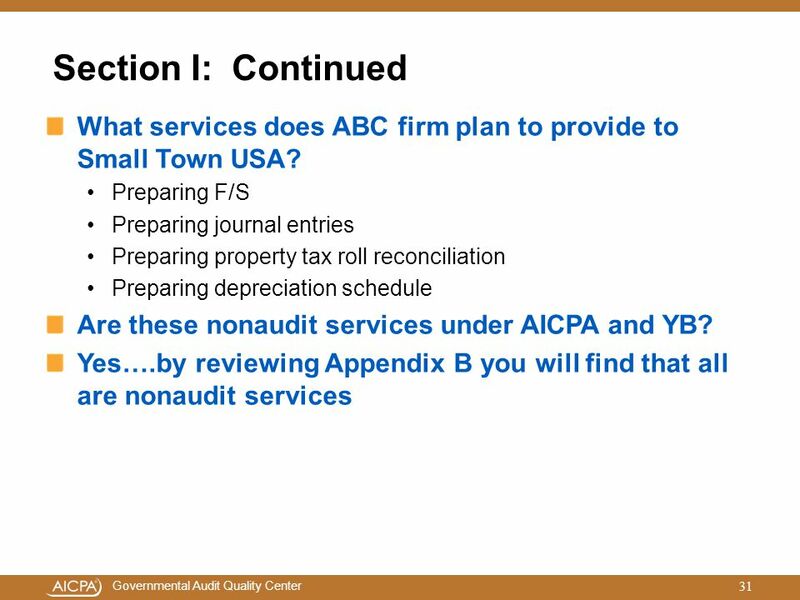 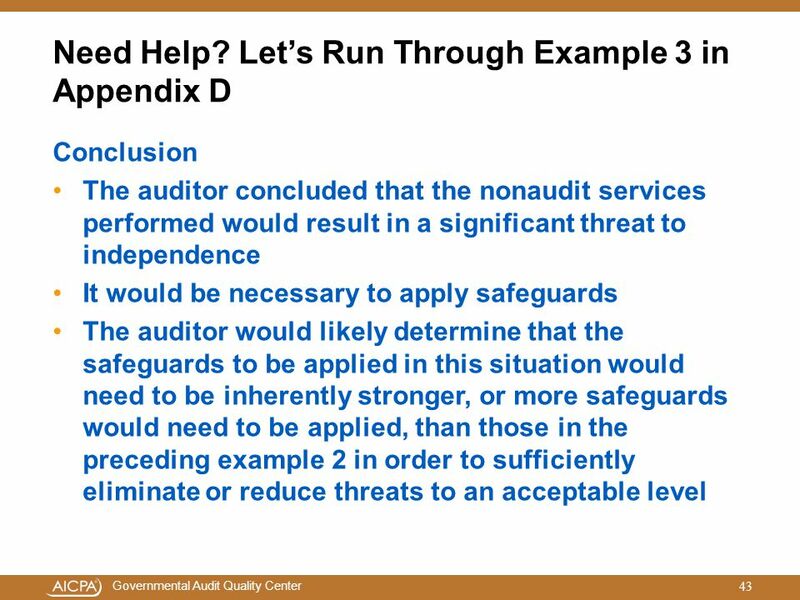 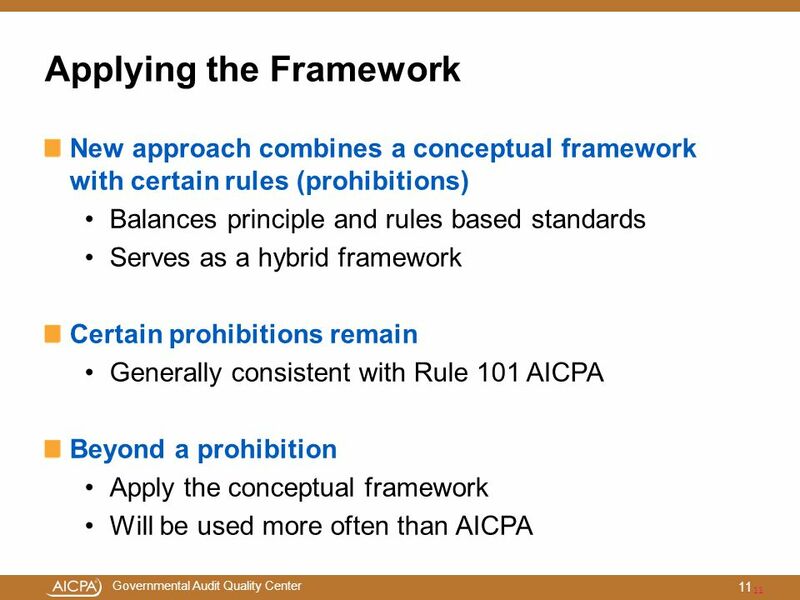 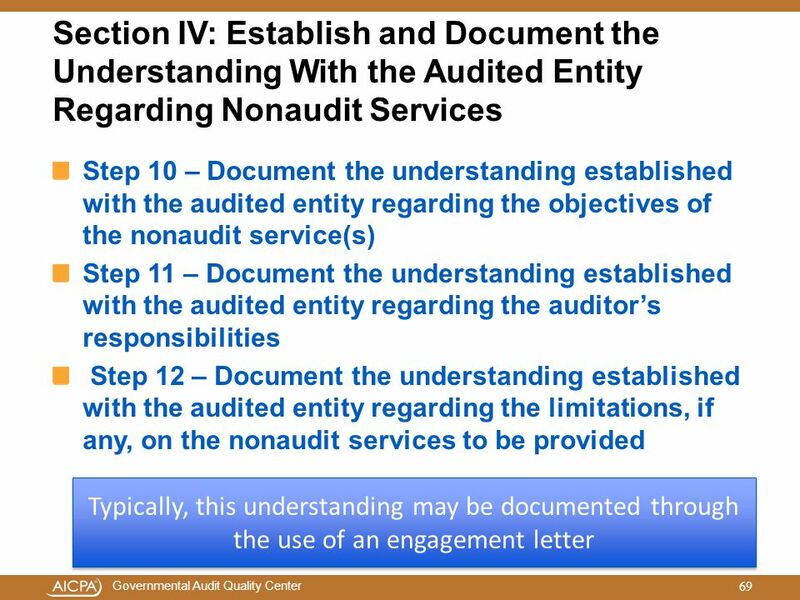 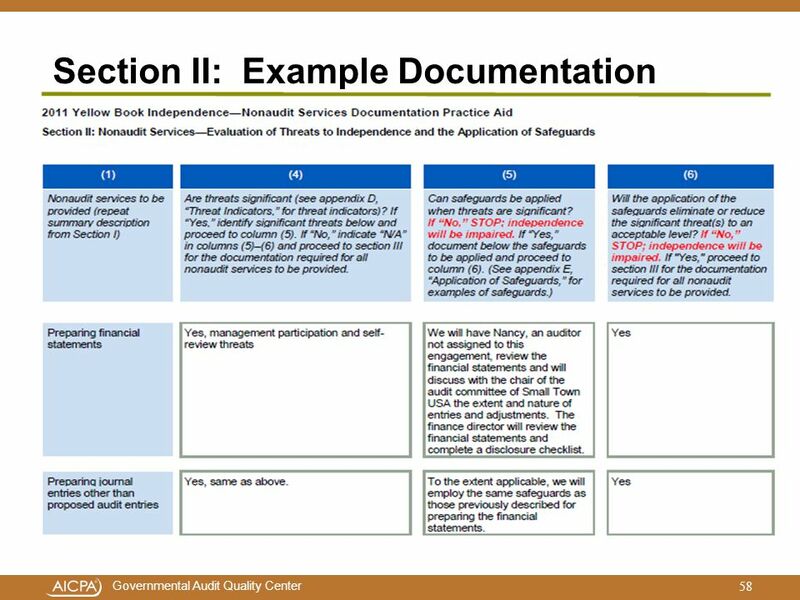 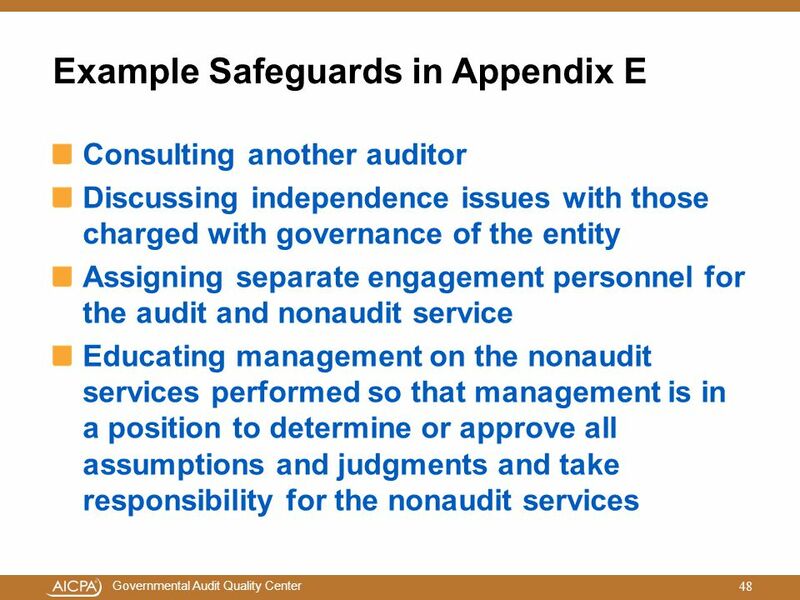 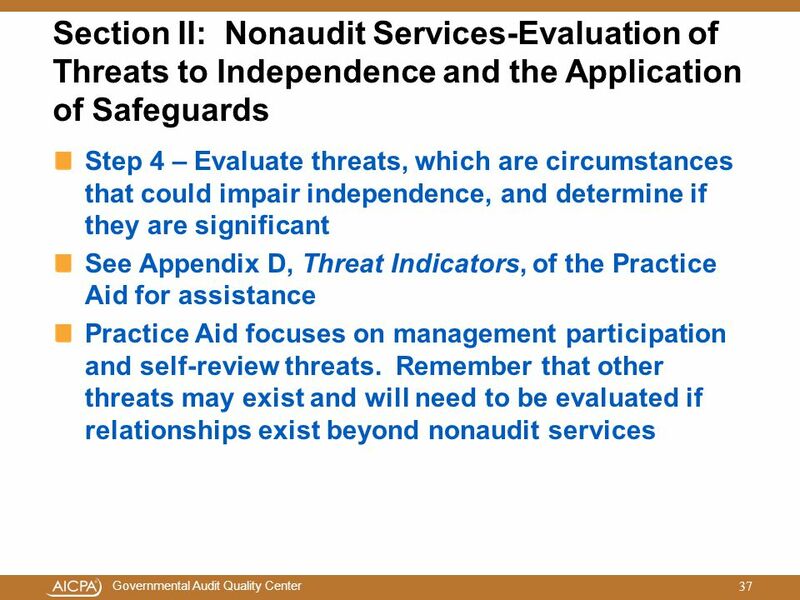 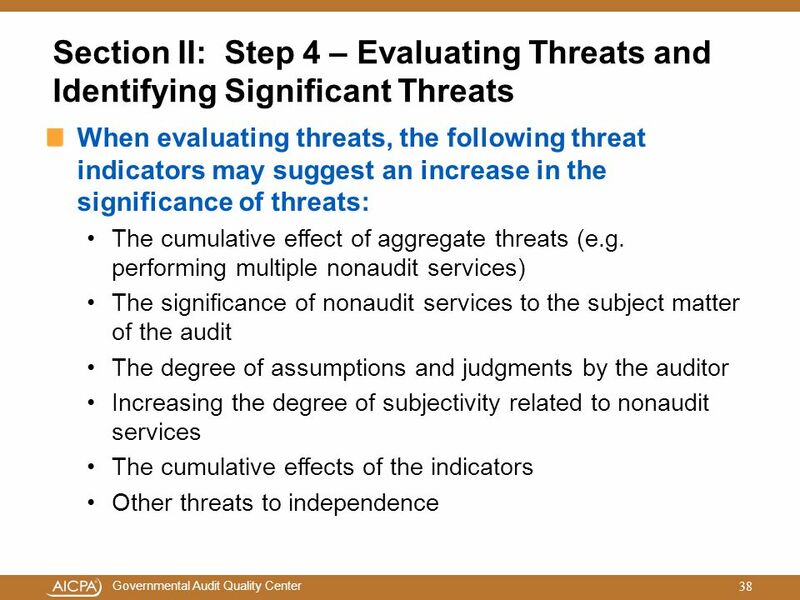 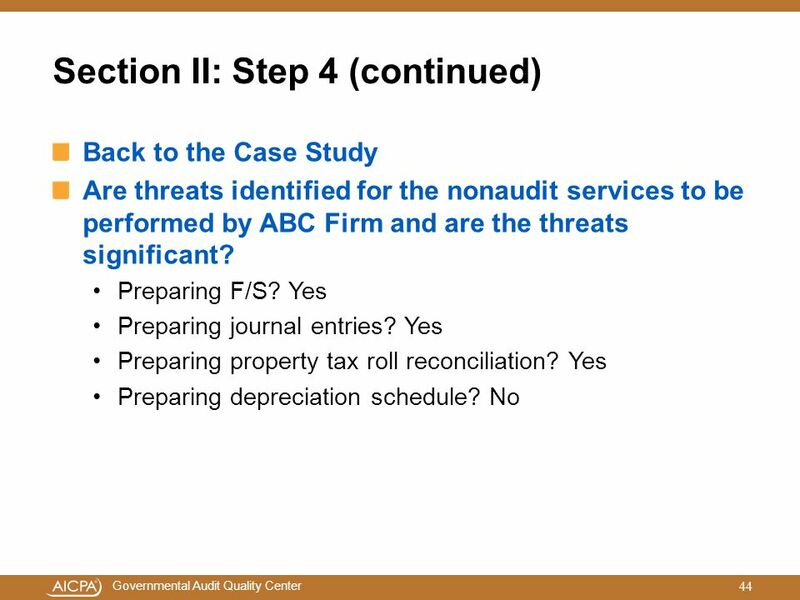 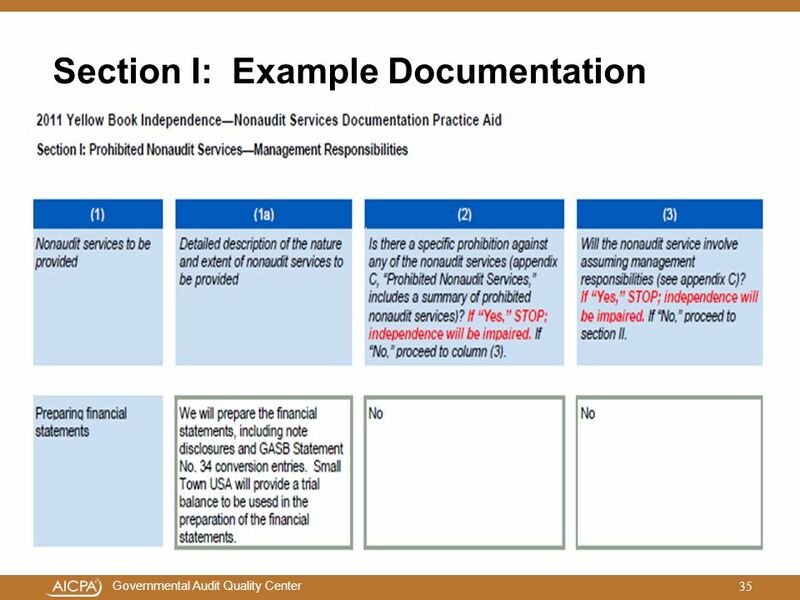 For the significant threats identified in step 4, in column 5 the auditor must evaluate potential safeguards and document those that will be applied As noted on previous slide, ABC Firm identified 3 nonaudit services with significant threats of management participation and self-review What safeguards can they apply that will eliminate or reduce the significant threat(s) to an acceptable level? 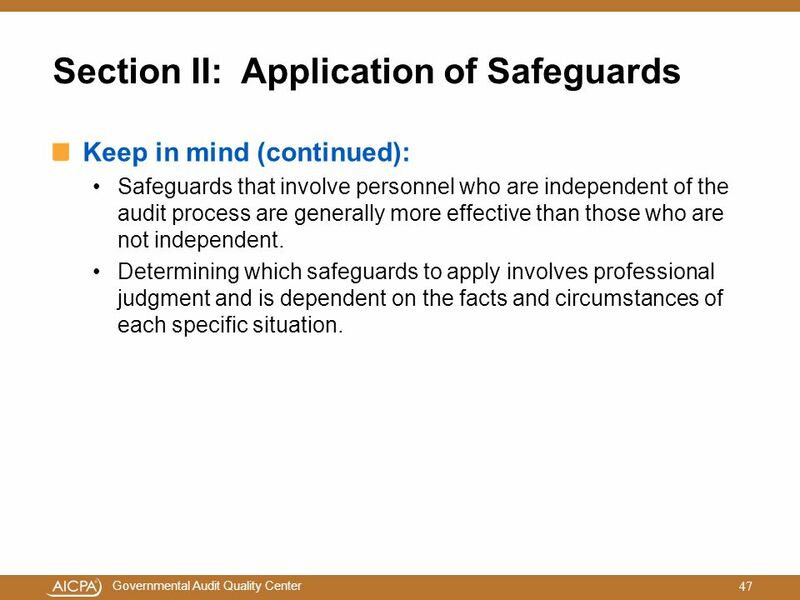 Keep in mind (continued): Safeguards that involve personnel who are independent of the audit process are generally more effective than those who are not independent. 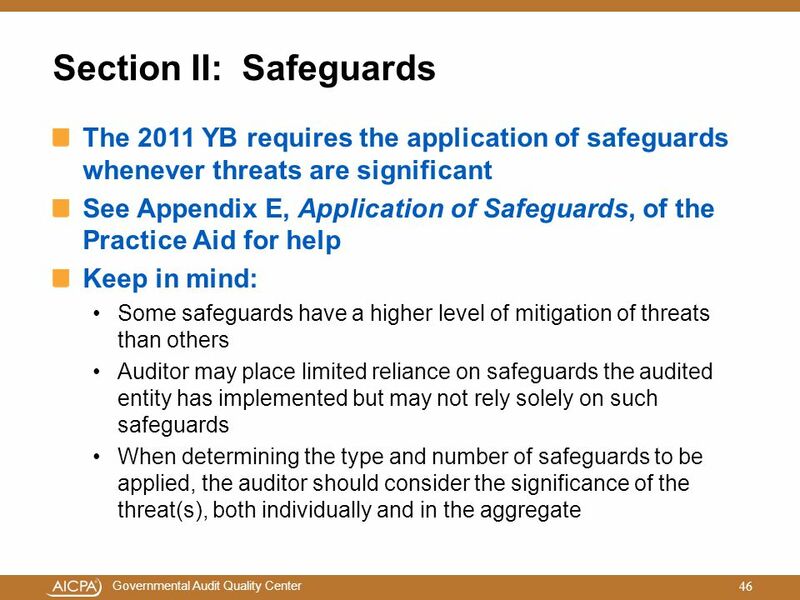 Determining which safeguards to apply involves professional judgment and is dependent on the facts and circumstances of each specific situation. 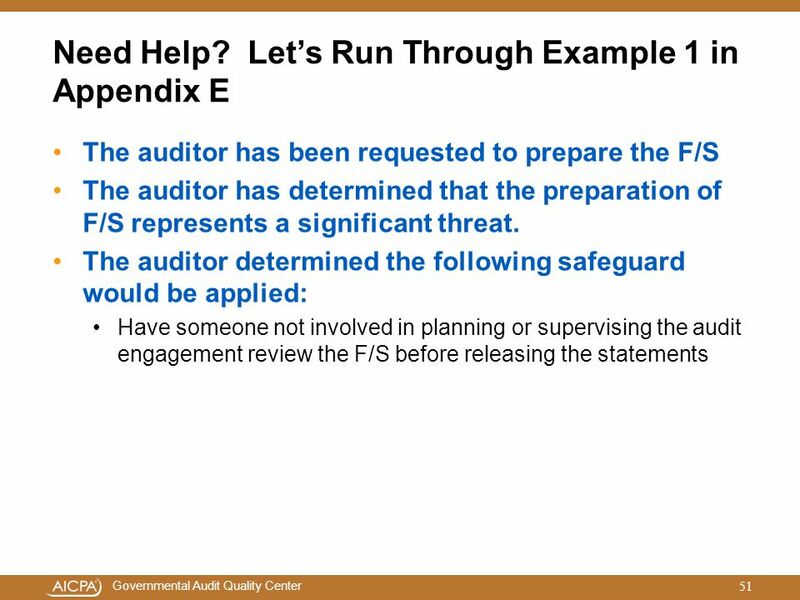 The auditor has been requested to prepare the F/S The auditor has determined that the preparation of the F/S represents a significant threat. 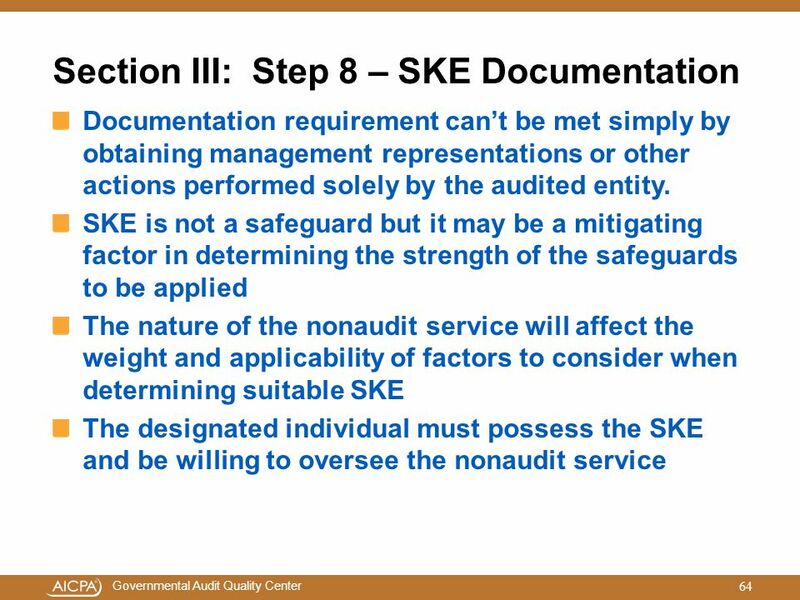 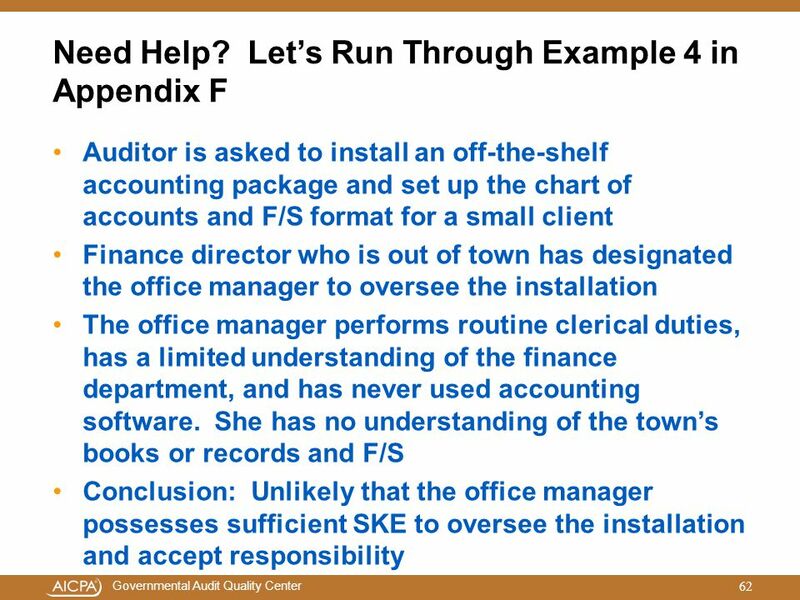 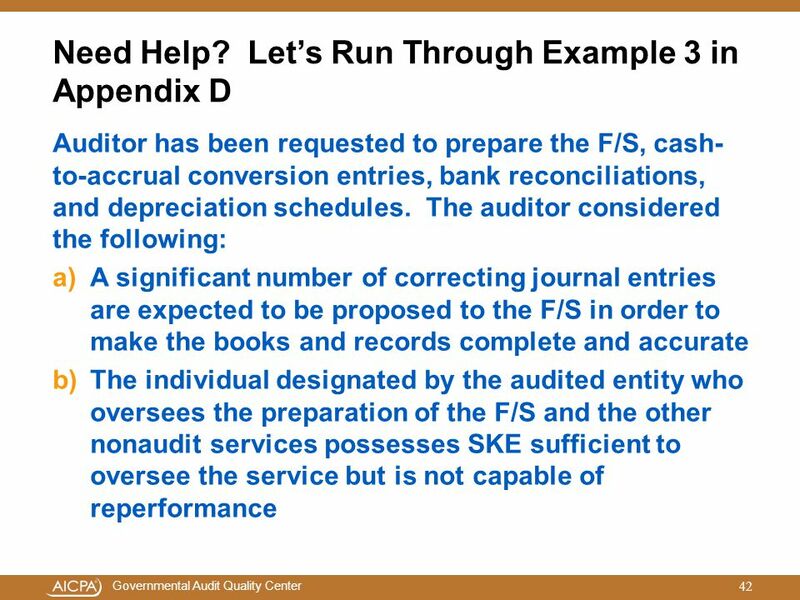 The auditor has concluded that, although the audited entity did possess suitable SKE, due to the poor condition of the books and records the following safeguard would be applied: Have a manager or partner not involved with the audit engagement team review the F/S before releasing the statements. 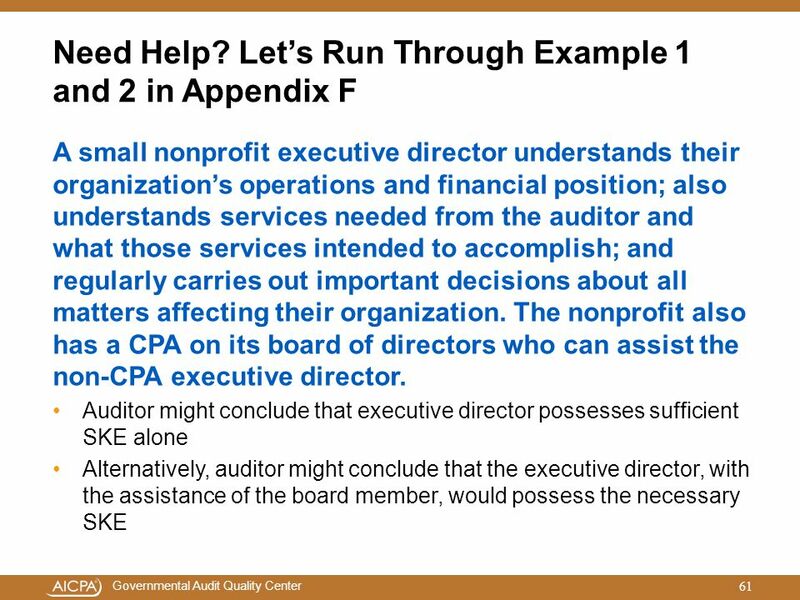 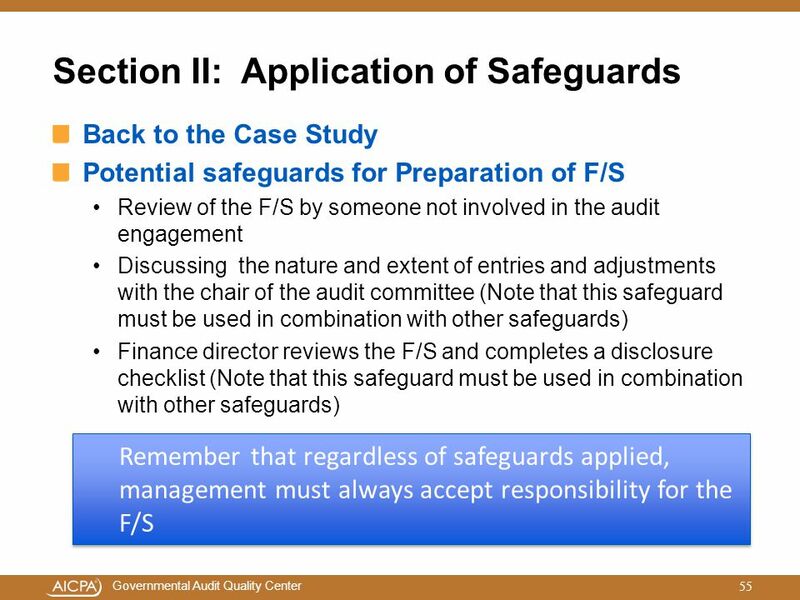 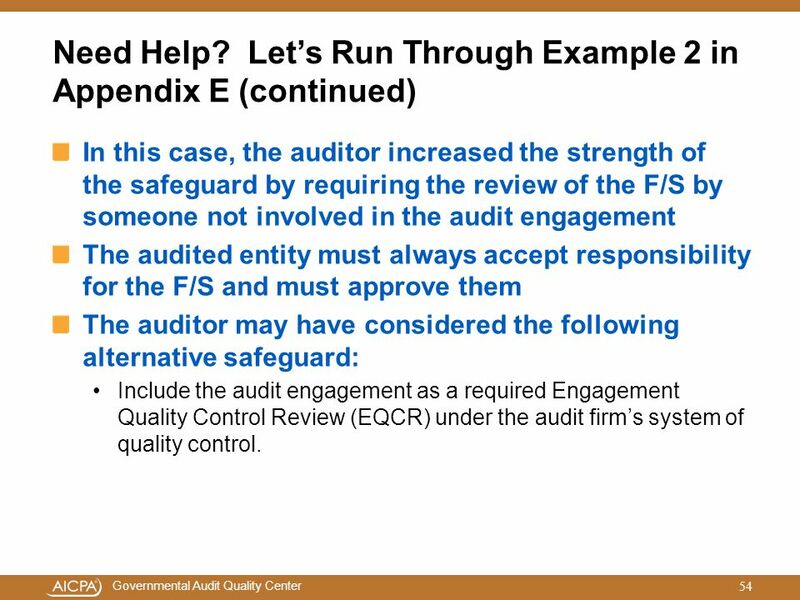 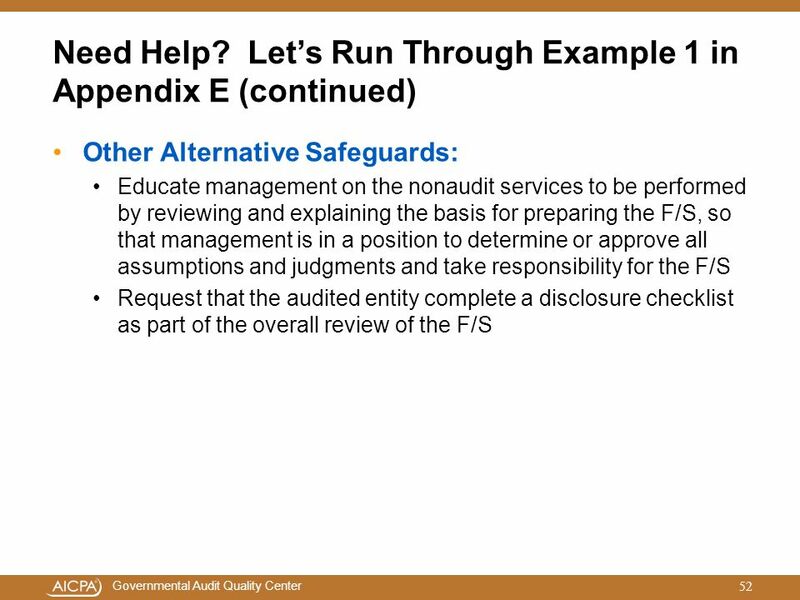 In this case, the auditor increased the strength of the safeguard by requiring the review of the F/S by someone not involved in the audit engagement The audited entity must always accept responsibility for the F/S and must approve them The auditor may have considered the following alternative safeguard: Include the audit engagement as a required Engagement Quality Control Review (EQCR) under the audit firm’s system of quality control. 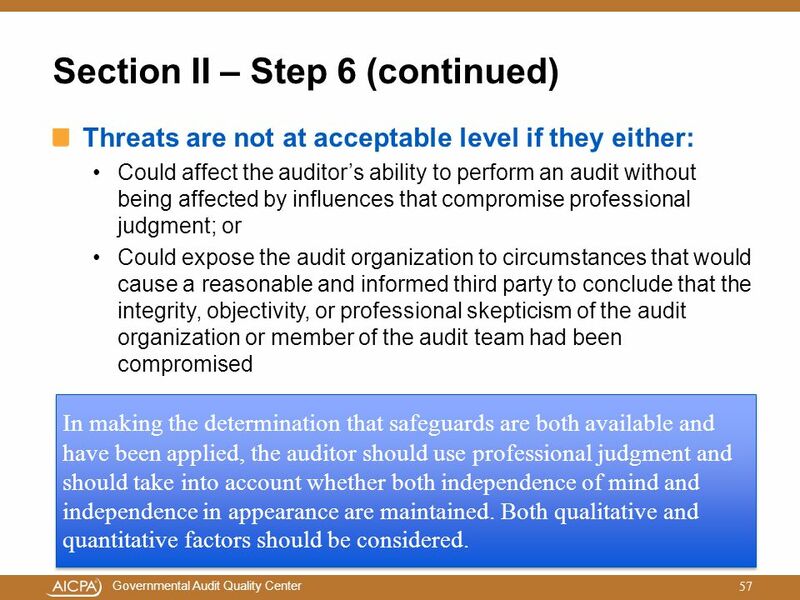 Threats are not at acceptable level if they either: Could affect the auditor’s ability to perform an audit without being affected by influences that compromise professional judgment; or Could expose the audit organization to circumstances that would cause a reasonable and informed third party to conclude that the integrity, objectivity, or professional skepticism of the audit organization or member of the audit team had been compromised In making the determination that safeguards are both available and have been applied, the auditor should use professional judgment and should take into account whether both independence of mind and independence in appearance are maintained. 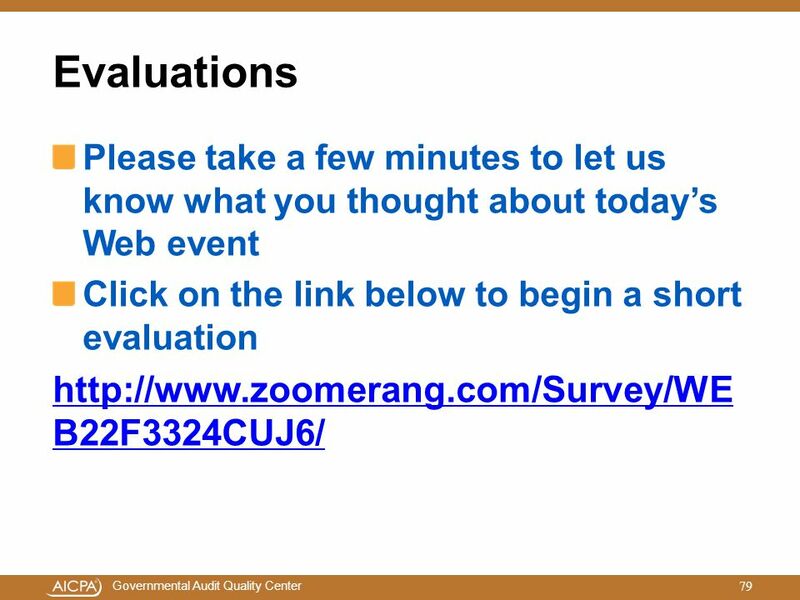 Both qualitative and quantitative factors should be considered. 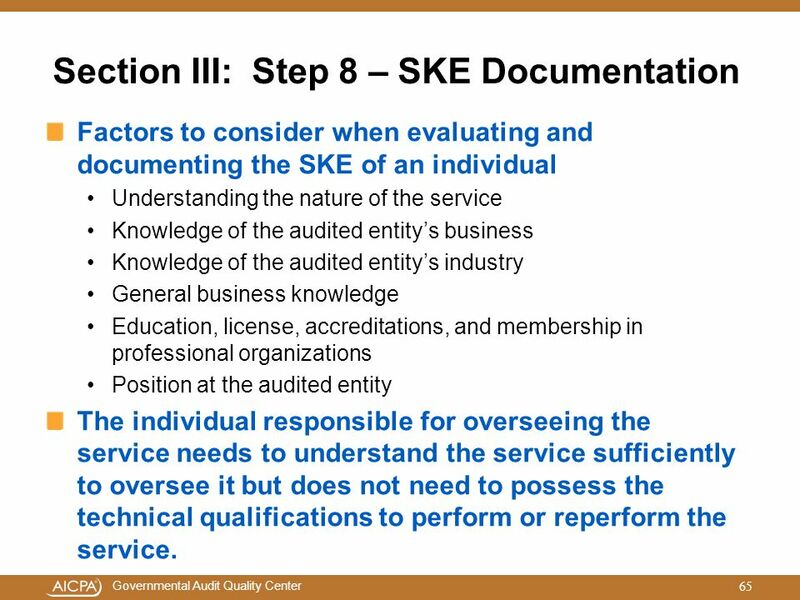 Factors to consider when evaluating and documenting the SKE of an individual Understanding the nature of the service Knowledge of the audited entity’s business Knowledge of the audited entity’s industry General business knowledge Education, license, accreditations, and membership in professional organizations Position at the audited entity The individual responsible for overseeing the service needs to understand the service sufficiently to oversee it but does not need to possess the technical qualifications to perform or reperform the service. 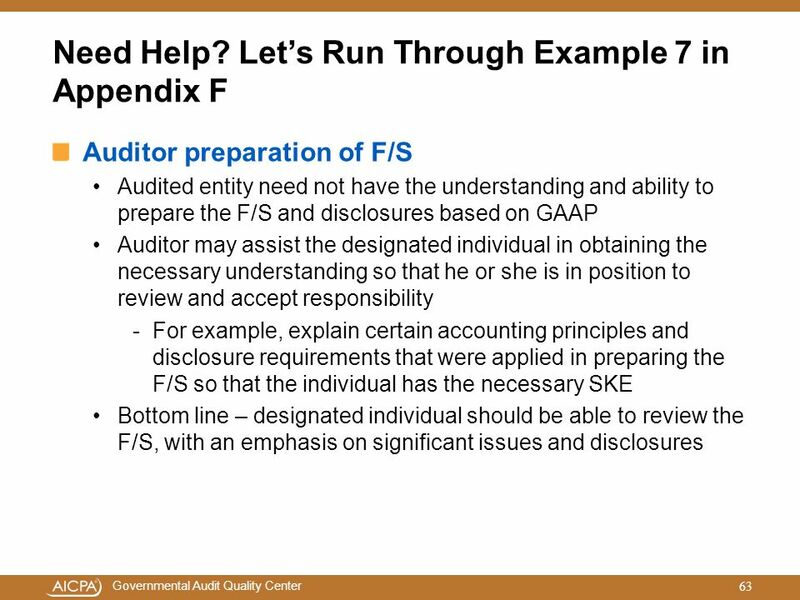 74 Where do you look for guidance? 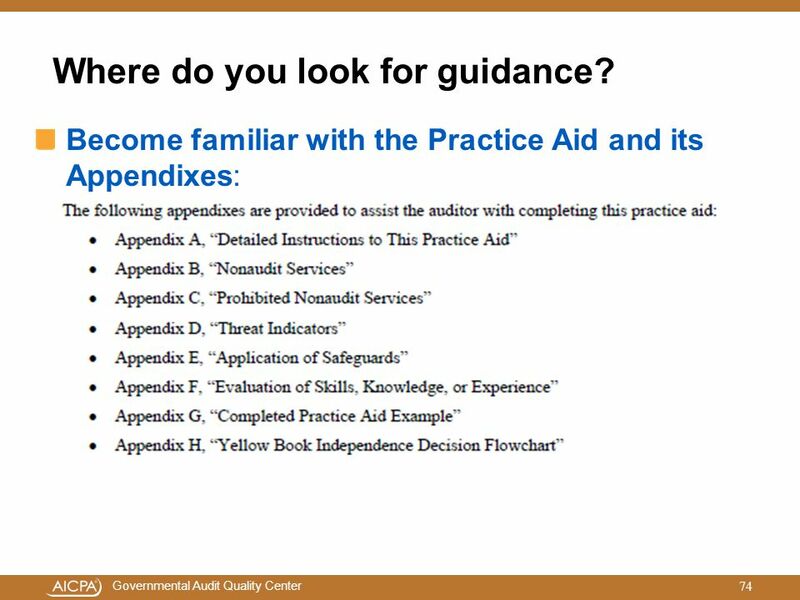 76 Where do you look for more guidance? 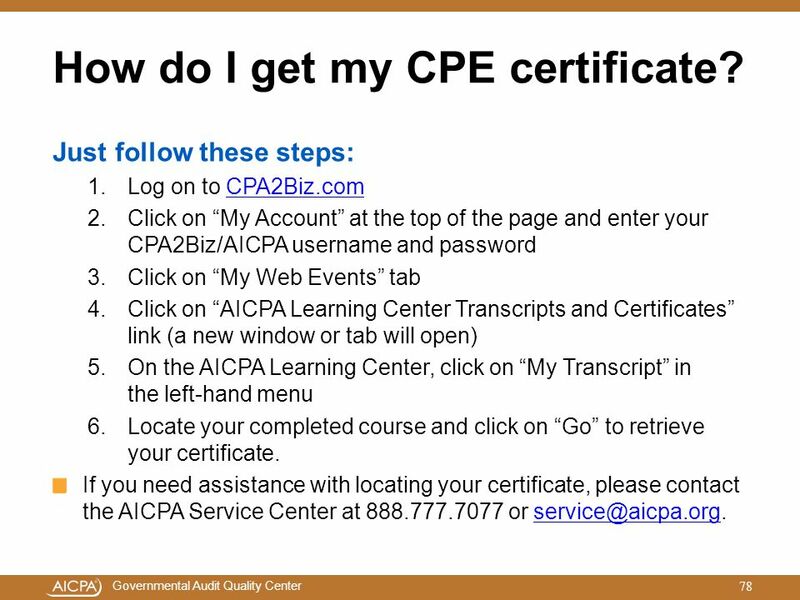 78 How do I get my CPE certificate? 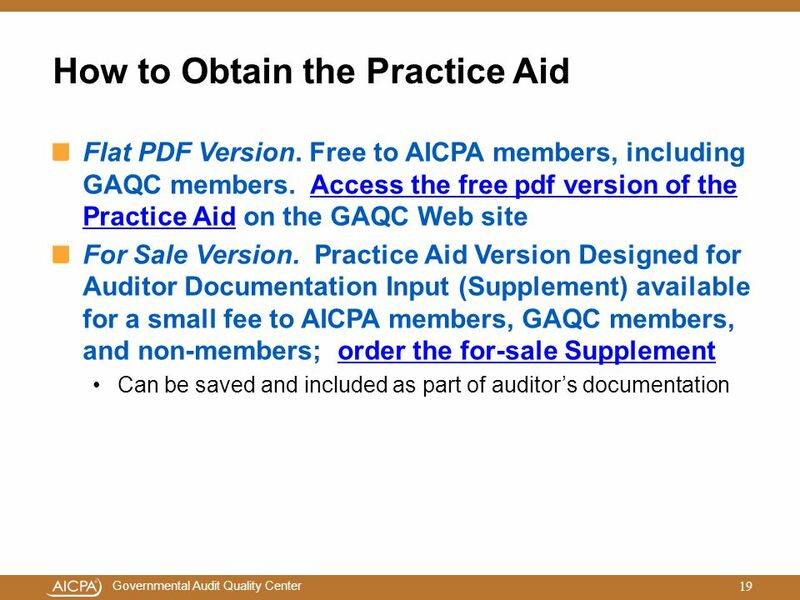 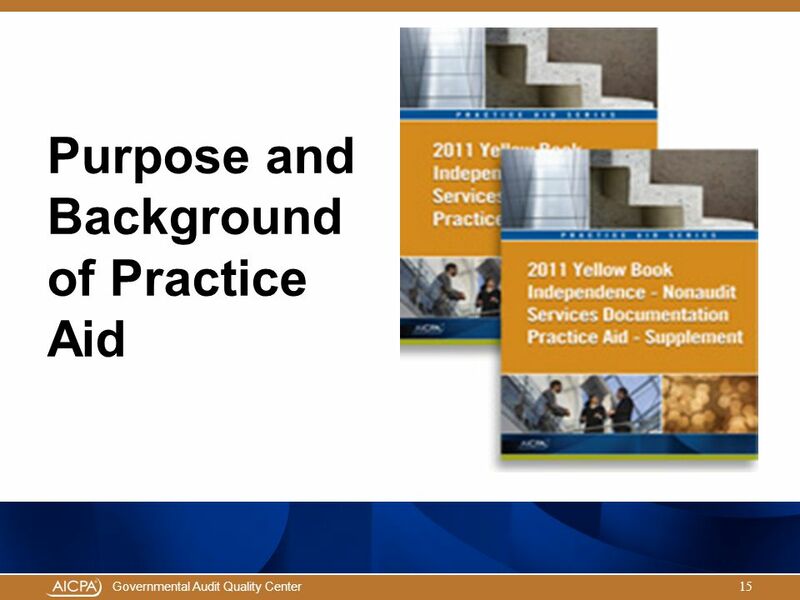 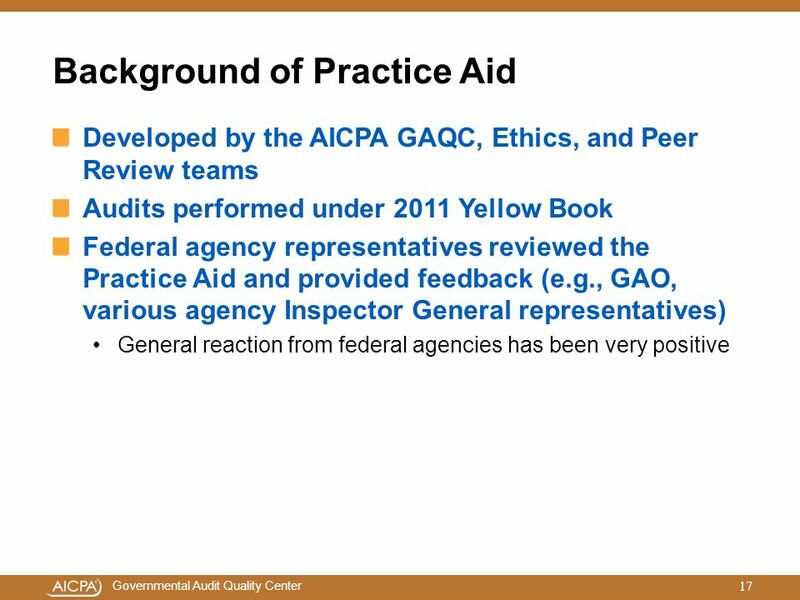 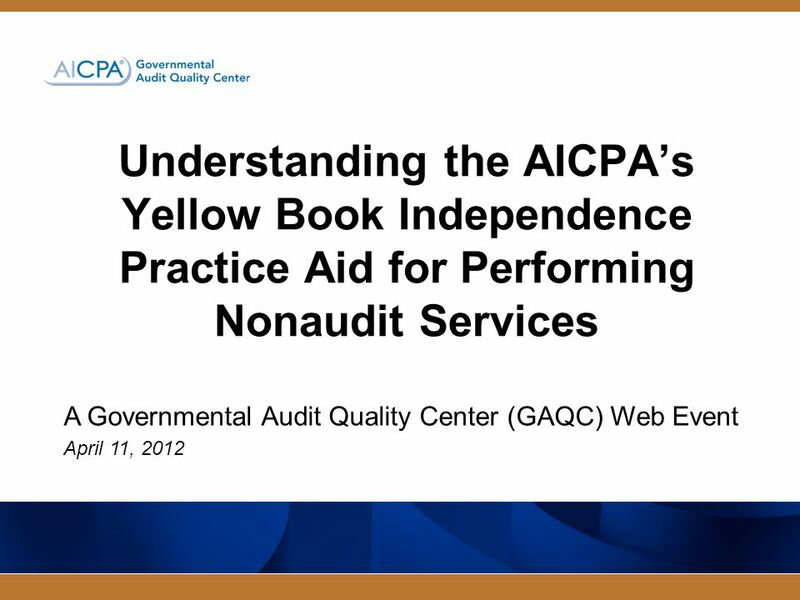 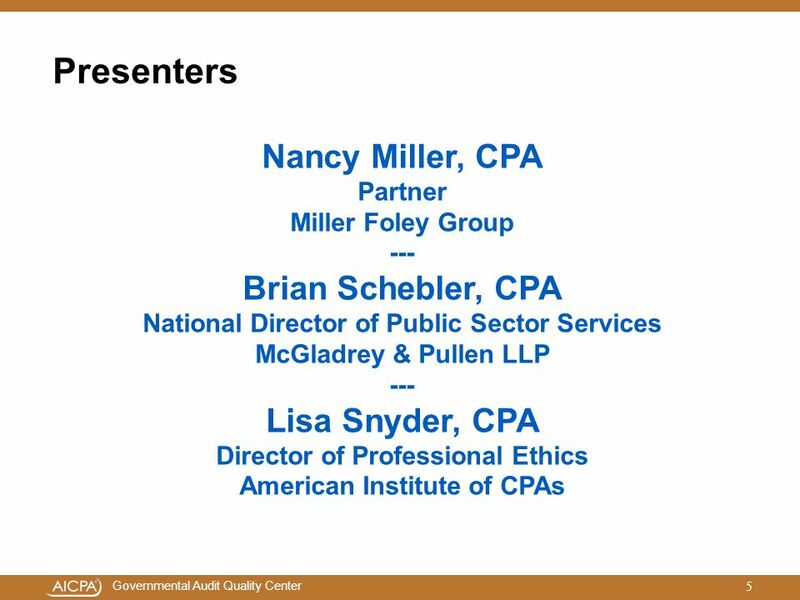 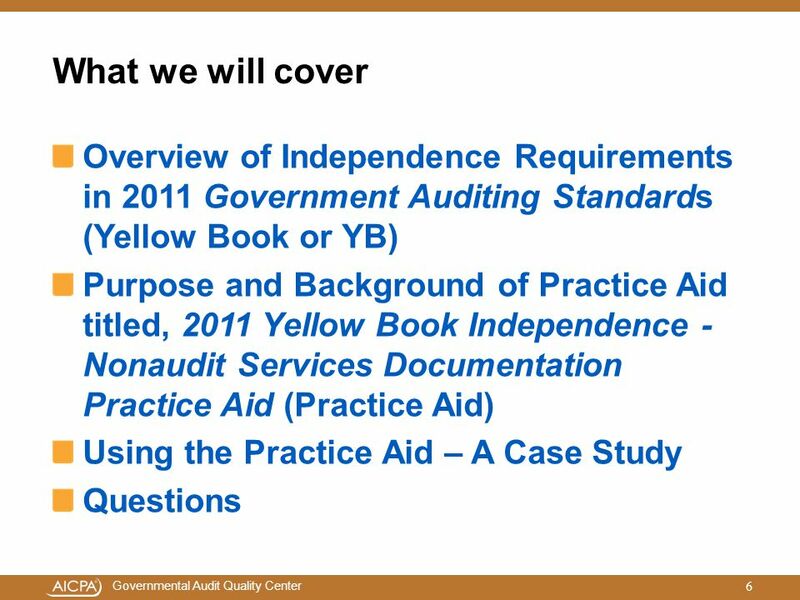 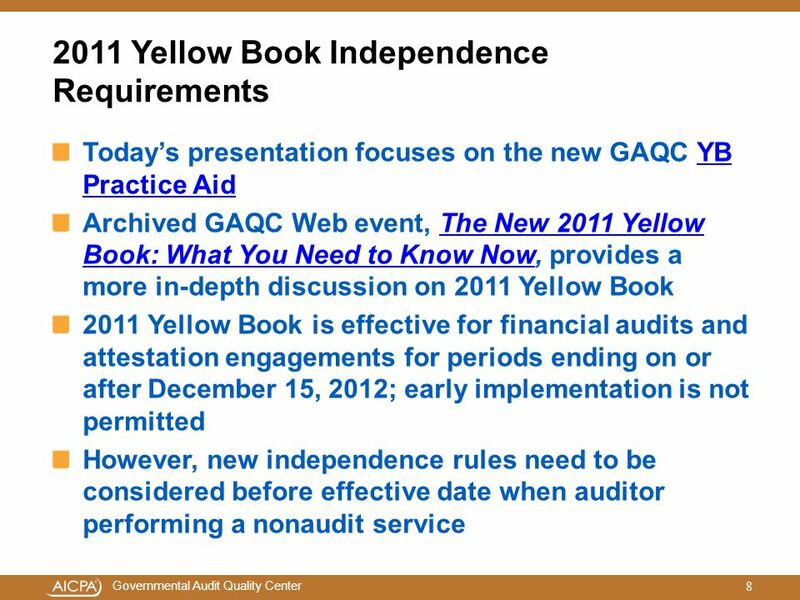 Download ppt "A Governmental Audit Quality Center (GAQC) Web Event April 11, 2012"
Yellow Book: Changes You Need to Know NASACT Training Webinar Marcia Buchanan May 4, 2011.